Showing items in category Bahamas, sorted by newest listed first. BAHAMAS - 1918 inward cover from Canada with 5d 'Special Delivery' adhesive added. 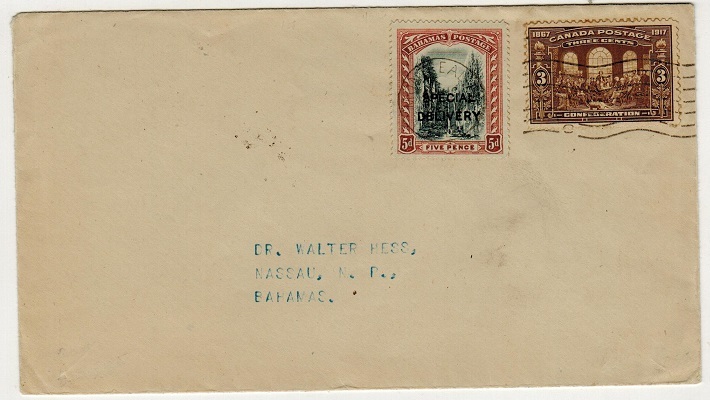 1918 inward cover addressed to Dr Walter Hess at Nassau bearing Canadian 3c brown tied in combination with Bahamas 5d 'staircase' adhesive overprinted SPECIAL/DELIVERY (SG S3) tied by MONTREAL cds and with NASSAU/BAHAMAS arrival b/s dated 22.APR.18. These stamps being used by special agreement with the Canadian Postal Services. The cover is complete with an original invoice from Earl P.L. Apfelbaum (philatelists) to a collector in 1940 and charged at $2 ! 1918 (JL.11.) 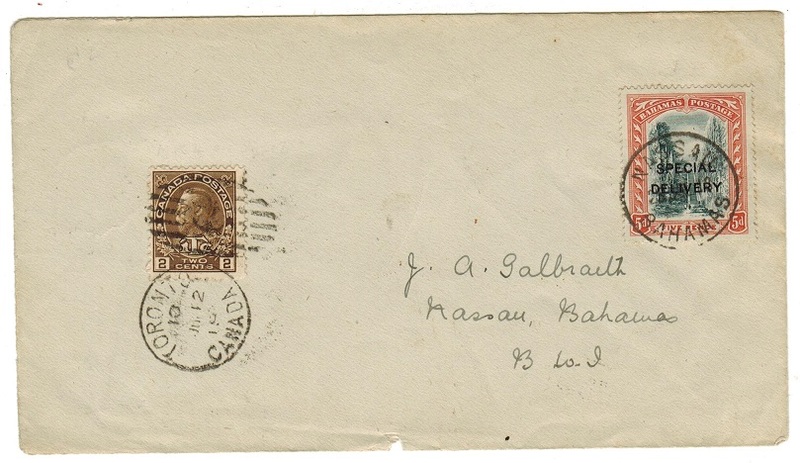 cover (Galbraith) addressed to Bahamas bearing Canadian 2c brown 'ITC' adhesive (fault) tied by barred oval strike with TORONTO/CANADA cds below and with Bahamas 5d 'Special Delivery' adhesive (SG S3) alongside cancelled NASSAU/BAHAMAS dated 6 days later. 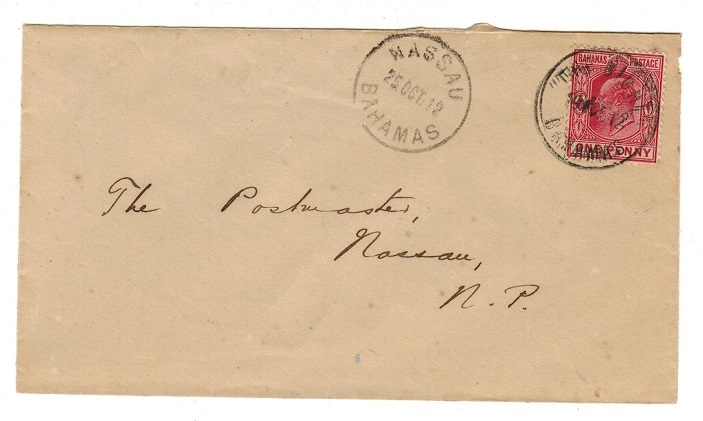 BAHAMAS - 1859 1d brown-lake unused with pen stroke denoting SPECIMEN. 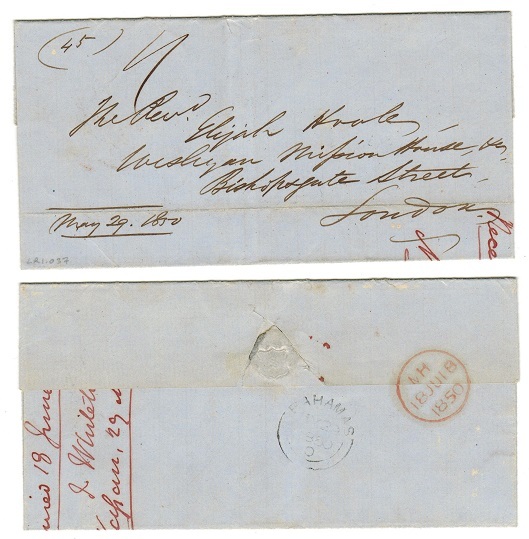 1859 1d brown lake on medium paper (SG type 1) in fine unused condition with official pen stroke running diagonally through stamp to denote SPECIMEN purposes. BAHAMAS - 1932 3d rate cover to USA used at THE CURRENT. 1932 (AUG.30) cover to USA bearing 1d (SG 116) strip of three tied by THE CURRENT/BAHAMAS cds. BAHAMAS - 1938 1 1/2d rate postcard use to USA struck 'POSTED AT DIRTY DICKS'. 1938 (JA.4.) use of picture postcard addressed to USA depicting 'Gregory Arch-Nassau' bearing 1 1/2d 'Coronation' adhesive tied by NASSAU-IDEAL TOURIST RESORT slogan strike and struck below by POSTED AT DIRTY DICKS/NASSAU handstamp. Sent from the hotel bar post box. BAHAMAS - 1938 'ATLANTIS' (First Passenger) 2 1/2d rate cover to USA with label. 1938 cover addressed to USA with winged monogram with FIRST PASSENGER TRIP TO ATLANTIS below. Bears perforated 75 skaloj 'Lemuria' bogus adhesive from Atlantis in green and black tied by ATLANTIS cancel with Bahamas 'GV' 2 1/2d adhesive added and tied by NASSAU/BAHAMAS cds dated 11.JAN.38. BAHAMAS - 1938 'ATLANTIS WORLDS FAIR' local unaddressed cover with label. 1938 local cover bearing 1/2d (SG 149) cancelled NASSAU/BAHAMAS cds cacheted at left ATLANTIS WORLDS FAIR/1941 h/s & bearing black & red on white ATLANTIS/50 Skaloj adhesive tied by ATLANTIS cds. Unusual. 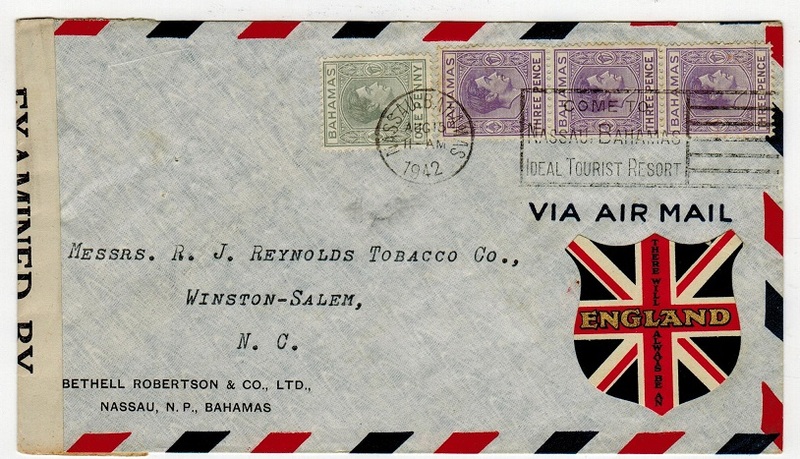 BAHAMAS - 1942 cover to USA with THERE ALWAYS BE AN ENGLAND patriotic label. 1942 (AUG.15.) 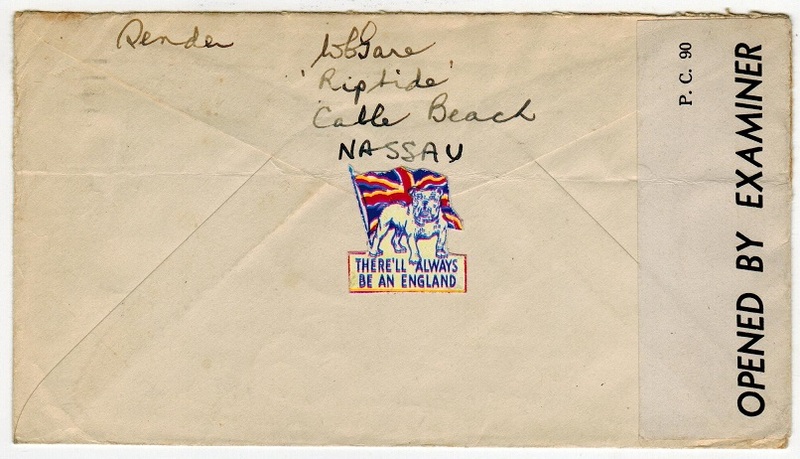 cover addressed to USA bearing 1d grey and 1 1/2d violet strip of three tied NASSAU/ IDEAL TOURIST RESORT slogan strike with black on white EXAMINED BY/3905 censor strip added on arrival and bearing the scarce 'Union Jack' ENGLAND/THERE WILL ALWAYS BE AN patriotic label. BAHAMAS - 1943 2 1/2d rate cover to Newfoundland with THERE ALWAYS BE AN ENGLAND PATRIOTIC label. 1943 (AUG.3.) 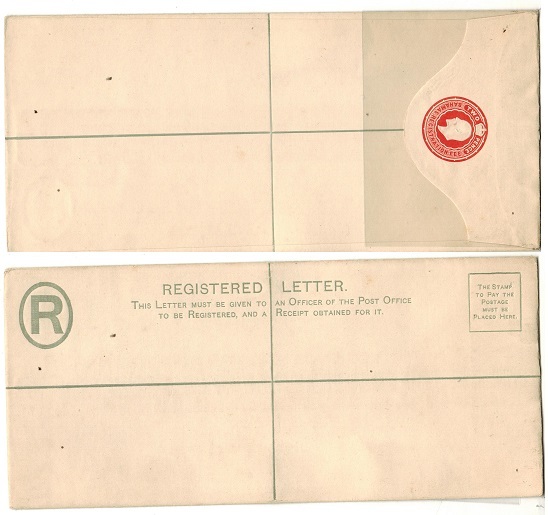 cover addressed to Newfoundland bearing 2 1/2d adhesive tied by NASSAU BAHAMAS/ P.C.90/OPENED BY EXAMINER/ IG/4804 censor label at left and with the reverse flap having a copy of the 'British Bull Dog' THERE'LL ALWAYS/BE AN ENGLAND patriotic label. Unusual item. 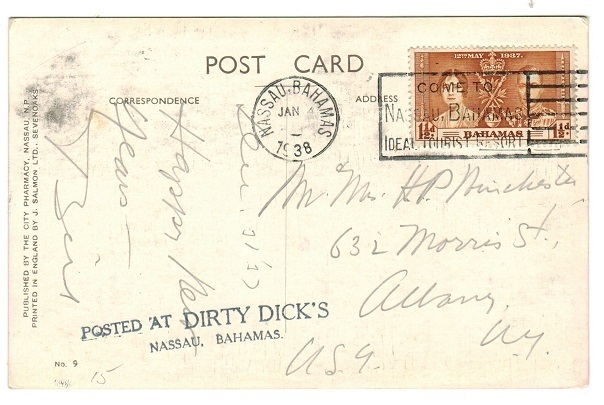 BAHAMAS - 1946 1 1/2d rate postcard use struck SHIP POST and (Hope) TOWN s/l handstamp. 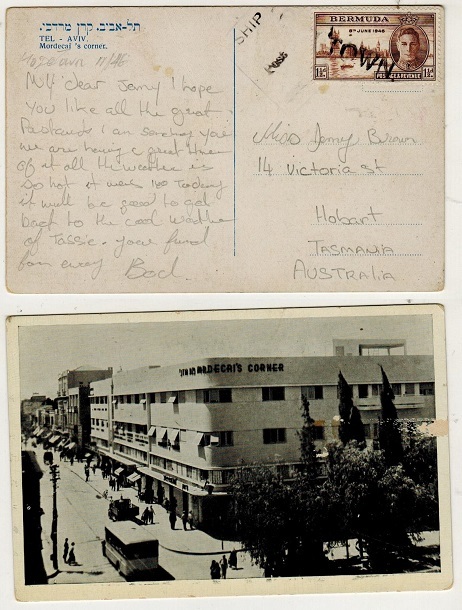 1946 use of picture postcard (Tel Aviv-Mordecai's Corner) addressed to Australia in pencil bearing 1 1/2d 'Victory' adhesive cancelled by large black TOWN h/s (probably eminating from Hope Town) and with boxed SHIP/POST maritime handstamp applied. Unusual item. BAHAMAS - 1970 (circa) 7c bright red RPSE unused. 1970 (circa) 7c bright red on greyish cream registered postal stationery envelope (size G) (blue interior) in fine unused condition. BAHAMAS - 1930 1d rate cover to UK used at HOPE TOWN. 1930 (JY.17.) 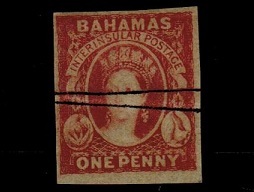 cover addressed to UK bearing 1d adhesive tied HOPE TOWN/BAHAMAS struck in 'blue' ink with a additional strike below. Some light tone spots but a scarce coloured ink striking. Proud type D3. 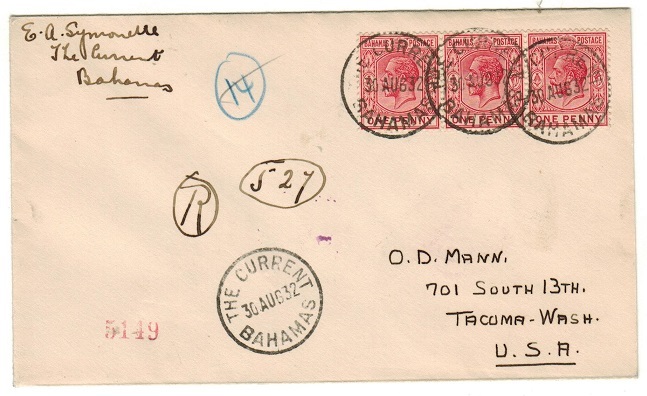 BAHAMAS - 1912 2d red RPSE to UK (damp faults) with 'MARLIN HEAD' cancel. H&G 3a. 1912 2d red on cream registered postal stationery envelope (size G) addressed to UK (affected by damp spots and opened on 3 sides) bearing 1 1/2d brown adhesive and struck on the front and reverse sides by the scarce 'Marlin Head' cancellator in red ink. (Proud type K2) used at Cat Island. H&G 3a. 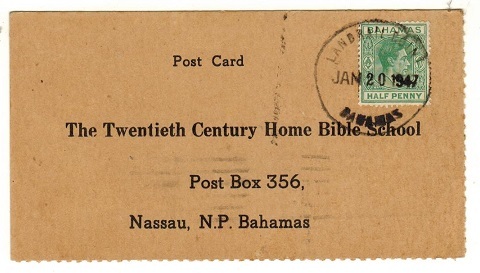 BAHAMAS - 1947 use of bible course card addressed locally used at LANDRAIL POINT/BAHAMAS. 1947 (JAN.20.) use of bible course card addressed locally bearing 1/2d green adhesive tied by temporary rubber LANDRAIL POINT/BAHAMAS cancel in black. 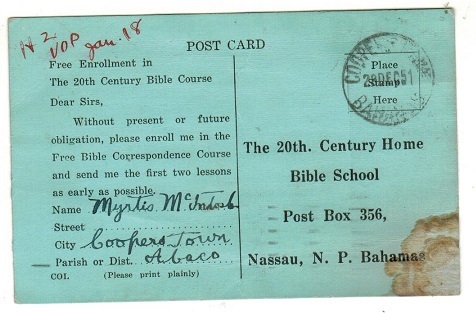 BAHAMAS - 1951 use of bible course card locally used at COOPERS TOWN/BAHAMAS cds. 1951 (DEC.28.) use of bible course card addressed locally without stamp and untaxed tied by COOPERS TOWN/BAHAMAS. 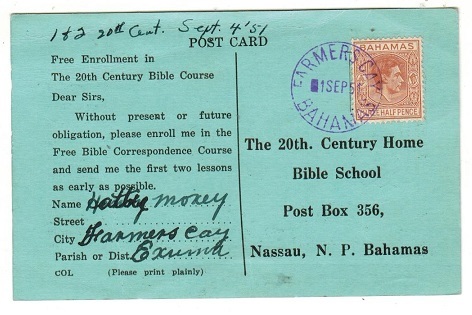 BAHAMAS - 1951 use of bible course card used at FARMERS CAY/BAHAMAS and struck in violet ink. 1951 (SEP.1.) use of bible course card addressed locally bearing 1 1/2d green adhesive tied by FARMERS CAY/BAHAMAS cds in violet ink. BAHAMAS - 1951 use of bible course card locally used at PIRATE WELL/BAHAMAS cds. 1951 (OCT.1.) use of bible course card addressed locally bearing 1d grey adhesive tied by PIRATE WELL/BAHAMAS cds. 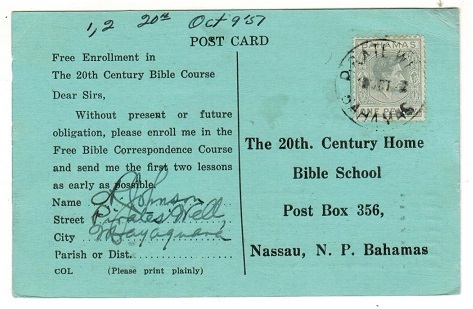 BAHAMAS - 1951 bible course card addressed locally used at KEMPS BAY/BAHAMAS cds. 1951 (JAN.3.) use of bible course card addressed locally bearing 1/2d and 2 1/2d adhesives tied by KEMPS BAY/BAHAMAS cds. 1939 (OCT.27.) 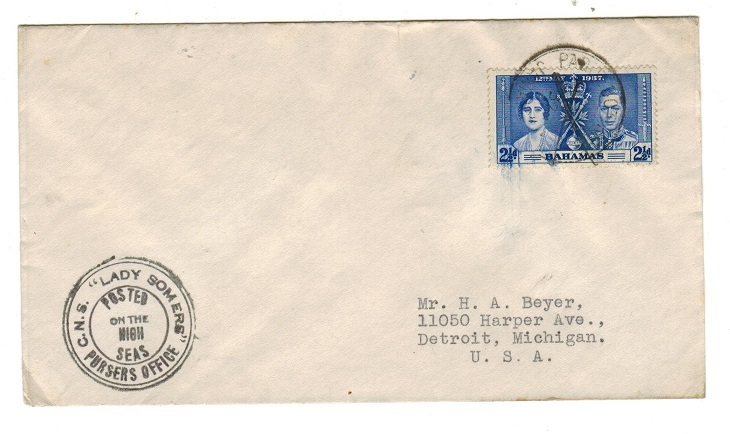 cover addressed to USA bearing 2 1/2d ultramarine adhesive tied NASSAU/ BAHAMAS with green straight lined PASSED BY CENSOR handstamp at left. Little type CH2. A nice early censor cover. 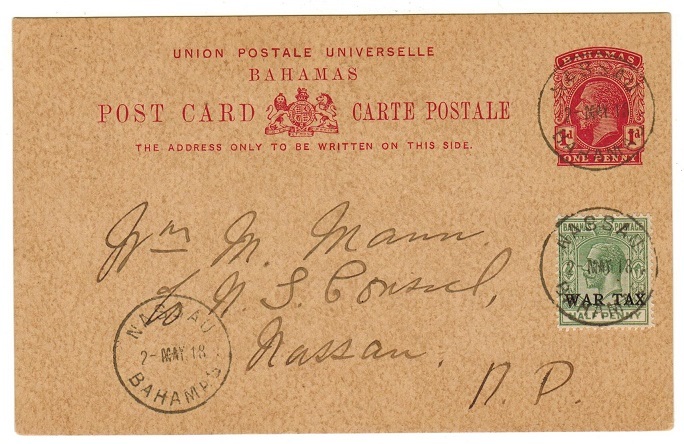 BAHAMAS - 1915 1d rate 'HAVE YOU BEEN TO NASSAU' cover to UK used at MANGROVE BAY. 1915 (JUN.29.) 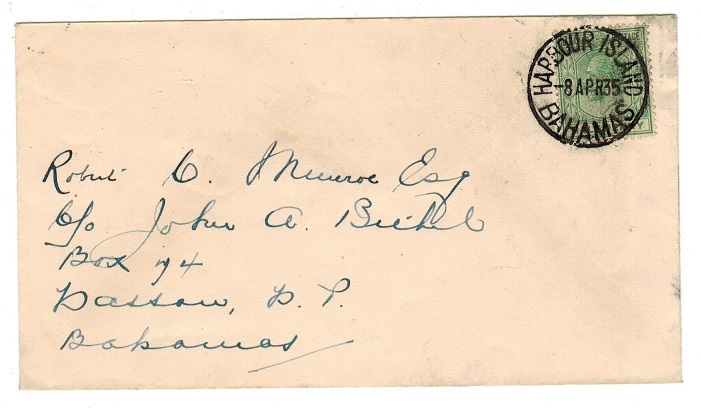 cover addressed to UK bearing 1d adhesive tied by light MANGROVE BAY cds with scarce black boxed HAVE YOU BEEN TO/NASSAU BAHAMAS/IF NOT, WHY NOT handstamp at left. Proud type HS3 in use for just 10 months. BAHAMAS - 1951 6d rate cover to USA used at MAN OF WAR CAY WAR/BAHAMAS 'TRD' cancel. 1951 (JAN.20.) 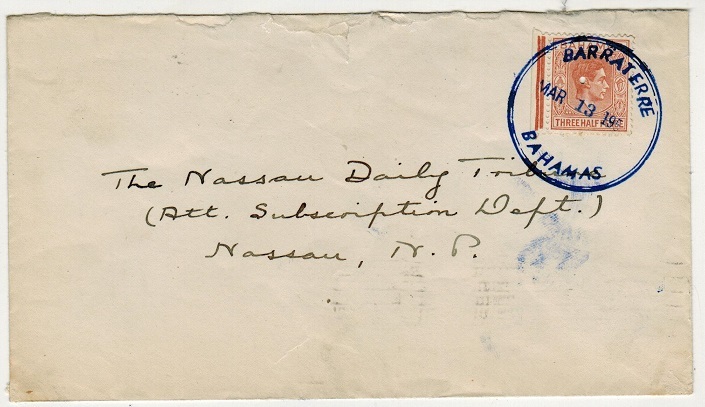 cover addressed to USA bearing 6d adhesive tied by circular rubber MAN OF WAR CAY/BAHAMAS 'TRD' cancel. 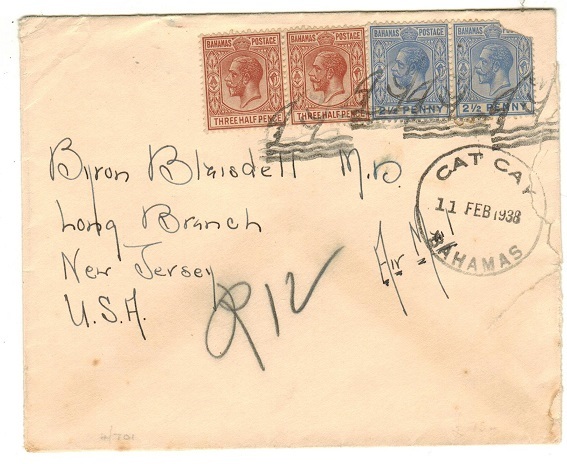 BAHAMAS - 1938 cover to USA (fault) cancelled by 'Marlin Head' CAT CAY/BAHAMAS cancels. 1938 (FEB.11.) 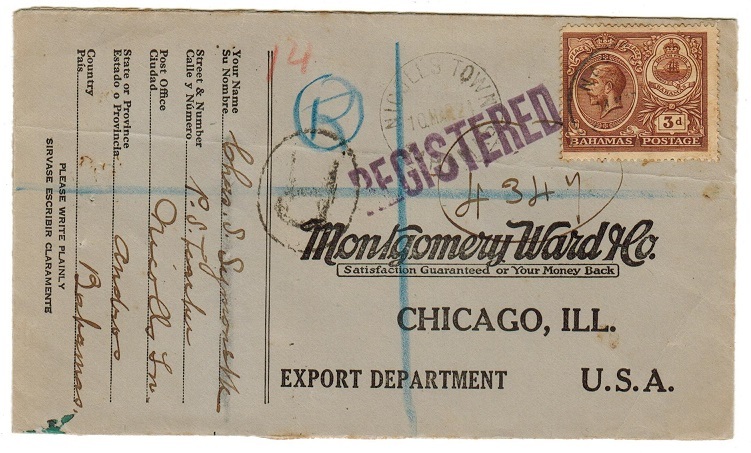 cover addressed to USA (roughly opened at right edge) bearing 1 1/2d pair and 2 1/2d pair tied by the 'Marlin Head' cancels with CAT CAY/BAHAMAS cds below. 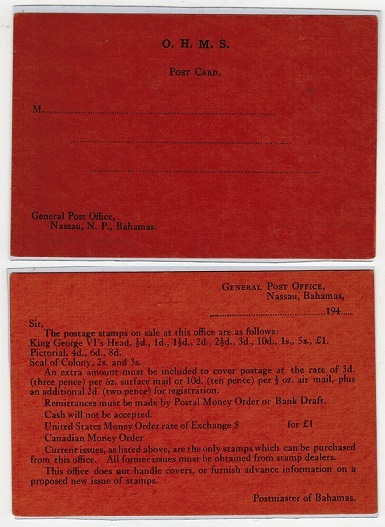 BAHAMAS - 1948 3/- rate cover to UK used at SANDY POINT. 1948 (JAN.24.) 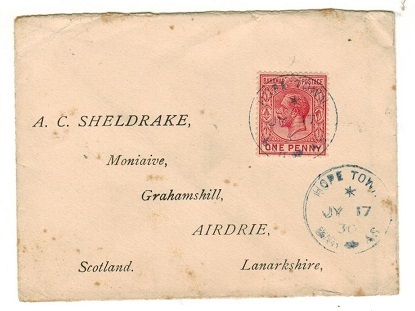 cover addressed to UK bearing 3/- adhesive (SG 190) tied by SANDY POINT trd strike (Proud type D1) struck in blue ink. 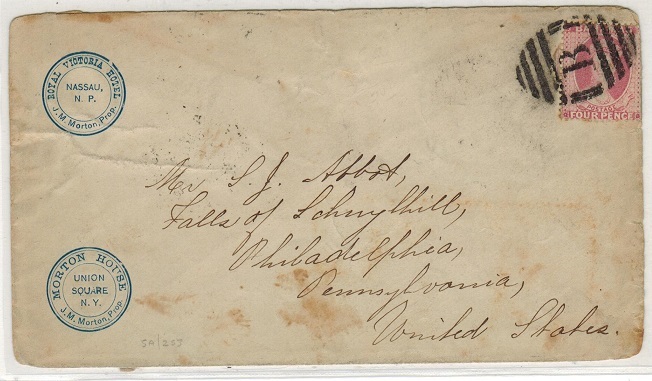 BAHAMAS - 1883 4d rose 'Chalon Head' cover to USA. 1883 (FE.15.) 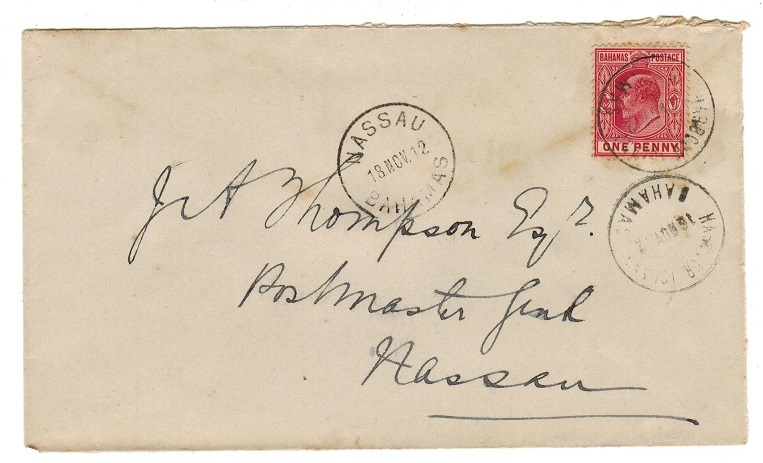 cover addressed to USA from the 'Royal Victoria Hotel' in Nassau bearing 4d 'chalon head' adhesive tied by 'B' barred duplex with s/r BAHAMAS b/s. Some light age marks but a scarce early cover. BAHAMAS - 1869 1d dull lake IMPERFORATE example with SPECIMEN manuscript lines. SG 2. 1859 1d dull lake IMPERFORATE example in mint condition crossed through by two horizontal manuscript lines officially used to denote 'SPECIMEN' purpose. SG 2. BAHAMAS - 1921 1d rate cover to USA used at THE BIGHT. 1921 (NOV.10.) cover addressed to USA bearing 1d adhesive tied THE BIGHT/BAHAMAS. Proud type D3. BAHAMAS - 1924 5d registered rate cover to UK used at GREEN TURTLE CAY. 1924 (JUL.7.) registered cover addressed to UK bearing 1d and 4d adhesives tied by single ringed GREEN TURTLE CAY/BAHAMAS cds. (Proud type D3). 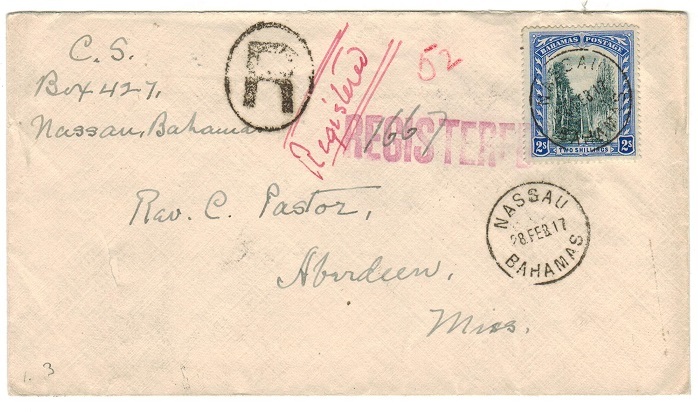 BAHAMAS - 1924 3d registered rate cover to USA used at NICHOLLS TOWN. 1924 (MAR.10.) 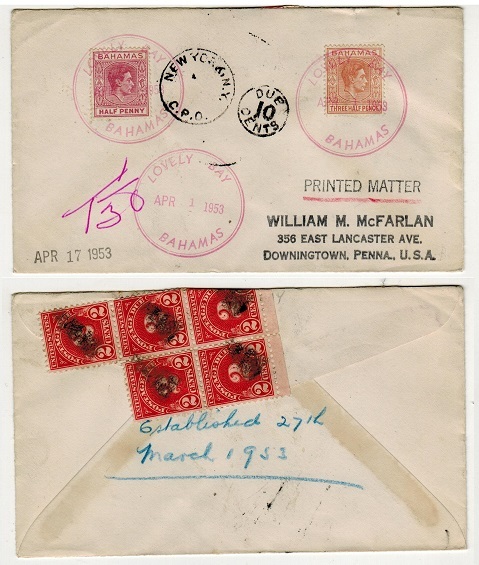 registered (Montgomery) cover addressed to USA bearing 3d 'Peace' adhesive tied by light NICHOLLS TOWN/BAHAMAS cds with stronger strike alongside. A scarcer village use. BAHAMAS - 1927 1d rate cover to USA used at GRAND BAHAMA. 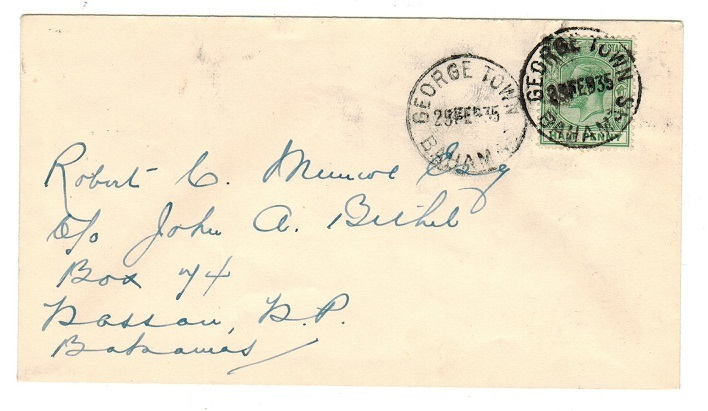 1927 (JUN.6) cover to USA bearing 1d (SG 111) tied by d/r GRAND BAHAMA cds (Proud type D2) with similar strike alongside. A difficult strike. BAHAMAS - 1940 (circa) 2d rate 'S.S.EVANGELINE' maritime postcard use to USA. 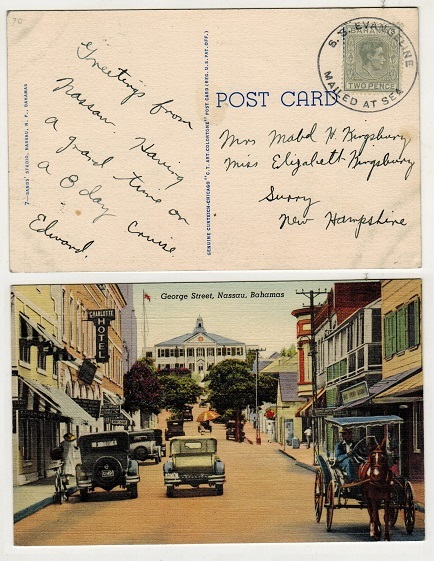 1940 (circa) undated postcard use to USA depicting 'George Street-Nassau' and bearing 2d grey adhesive tied by S.S.EVANGELINE/MAILED AT SEA maritime handstamp. BAHAMAS - 1952 8d rate cover to UK used at LOWER DEADMANS CAY. 1952 (JUN.13) cover to UK bearing 8d (SG 160) tied by large violet LOWER DEADMAN'S CAY/BAHAMAS temporary rubber date stamp with similar strike alongside. (Luddington type TRD 2C2). BAHAMAS - 1953 2d rate cover to USA used at BENNETTS HARBOUR. 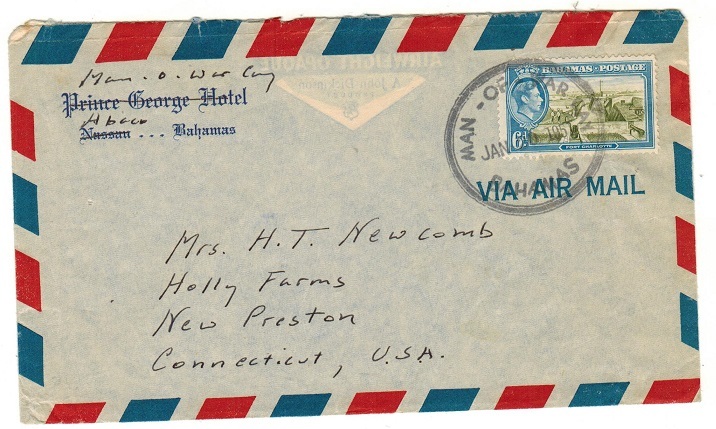 1953 (FEB.28) cover to USA bearing 'KGVI' 1/2d & 1 1/2d adhesives (SG 149e+151) tied by individual blue BENETTS HARBOUR/BAHAMAS temporary rubber datestamp. (Lud type TRD 2C2). BAHAMAS - 1947 1/2d local rate cover used at DEVILS POINT. 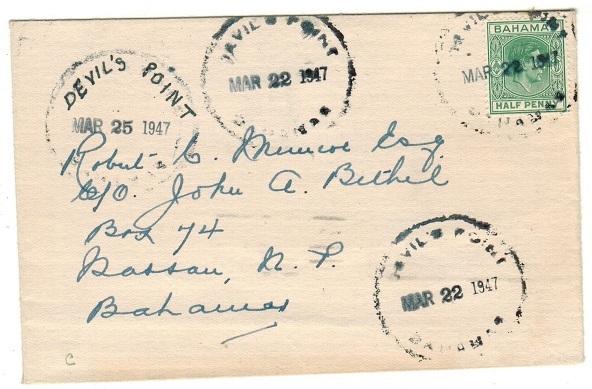 1947 (MAR.22) cover addressed locally bearing 1/2d adhesive tied by DEVILS POINT/BAHAMAS TRD cancel in blue-black. (Luddignton type TRD 3c. Three additional strikes alongside. Scarce. BAHAMAS - 1949 cover to UK used at DEEP CREEK/ELEU. 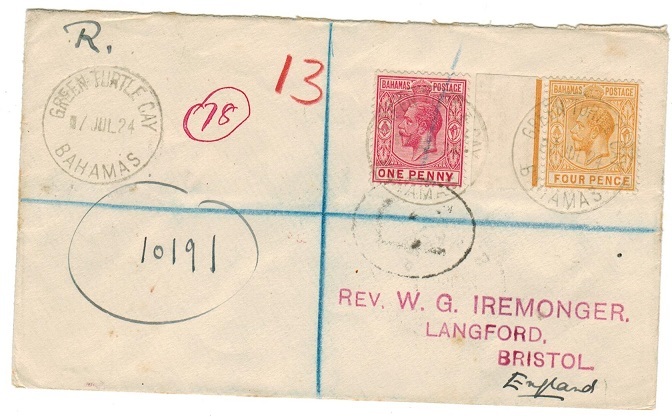 1949 (MAR.6) cover to UK bearing 2d (x4) and 2 1/2d adhesives (SG 181+182) cancelled by various DEEP CREEK/ELEU/BAHAMAS temporary date stamp in violet. (Luddington type TRD C4 with the inserted date slugs). BAHAMAS - 1952 2d rate cover to USA used at MAN OF WAR CAY. 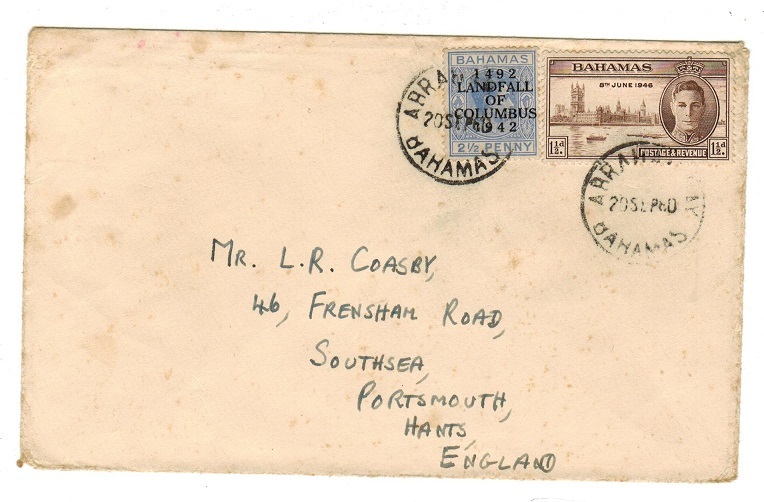 1952 (MY.14) cover to USA bearing 2d (SG 152c) tied by MAN OF WAR CAY/BAHAMAS temporary rubber date stamp (Luddington type TRD 3C) with several other strikes at left. NASSAU/BAHAMAS transit cds dated 21.MY.52. BAHAMAS - 1948 5/- lilac and blue mint COLOUR CHANGELLING with frame PRINTED IN GREY. SG 156. 1948 5/- lilac and blue mounted mint example of a COLOUR CHANGELLING showing the frame PRINTED IN GREY. Unusual item. SG 156. BAHAMAS - 1863 1/- green fine used block of four. SG 39b. 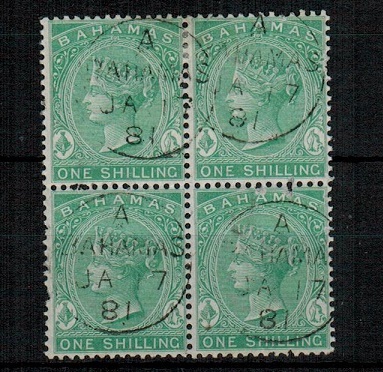 1863-80 1/- green (perf 14) issue in a block of four (few odd perf faults) cancelled by neat BAHAMAS cds's dated JA.17.81. SG 39b. 1938 2d pale grey in a fine unmounted mint sheet numbered corner marginal block of four. SG 152. BAHAMAS - 1964 6d 'Shakespear' adhesive U/M with INVERTED WATERMARK. SG 244w. 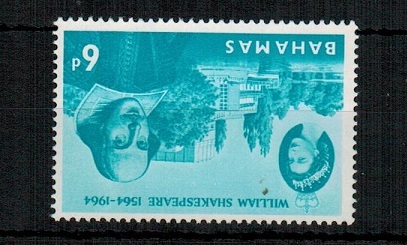 1964 6d turquoise 'William Shakespear' adhesive in fine in mounted mint condition showing the variety WATERMARK INVERTED. SG 244w. BAHAMAS - 1938 5,10,25+50sk ATLANTIS cinderella stamps IMPERFORATE. 1938 (circa) 5 sk, 10sk, 25sk and 50sk ATLANTIS adhesives each in IMPERFORATE examples These 'cinderella' stamps often found used in conjuction with Bahamas covers around this period due to the 'Williamson Photoshere' on the sea floor that filmed sea life. 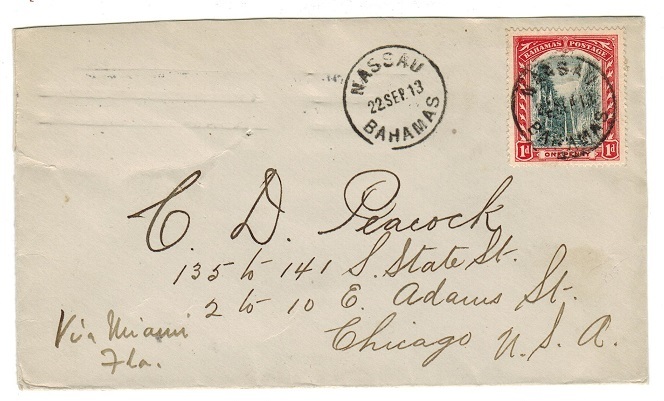 BAHAMAS - 1917 2/- rate registered cover to USA used at NASSAU. 1917 (FEB.28.) 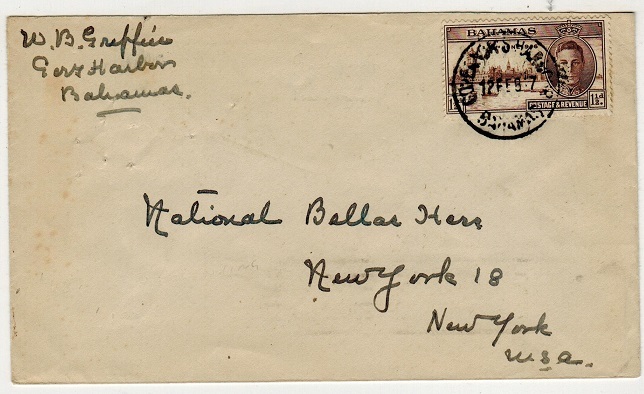 registered cover addressed to USA bearing the 2/- black and blue 'Staircase' issue tied by NASSAU/BAHAMAS cds. 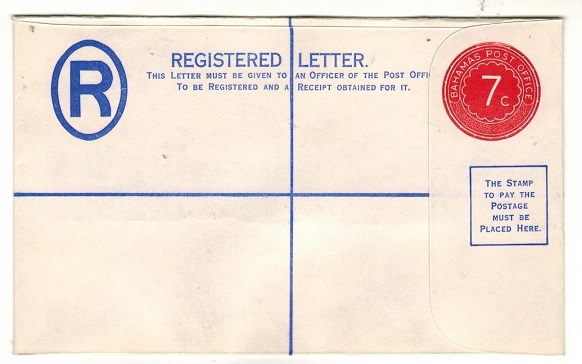 A scarcer 'single franking' stamp on cover. 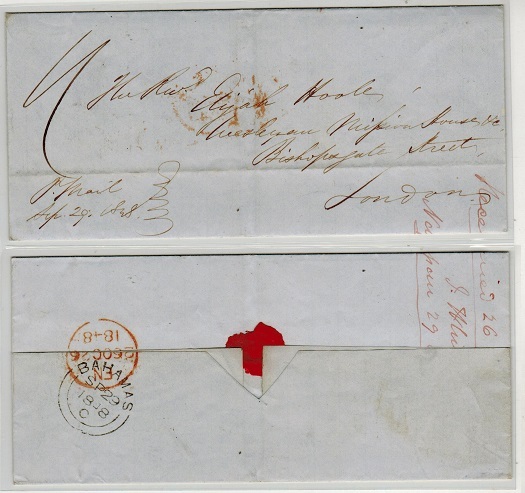 BAHAMAS - 1848 outer wrapper to UK struck by BAHAMAS cancel on reverse. 1848 (SP.29.) outer wrapper addressed to UK cancelled on the reverse side by fine BAHAMAS double arc cancel and rated '1/-' in manuscript on the front. 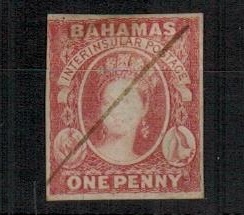 BAHAMAS - 1902 2d red RPSE (size H2) unused. H&G 2b. 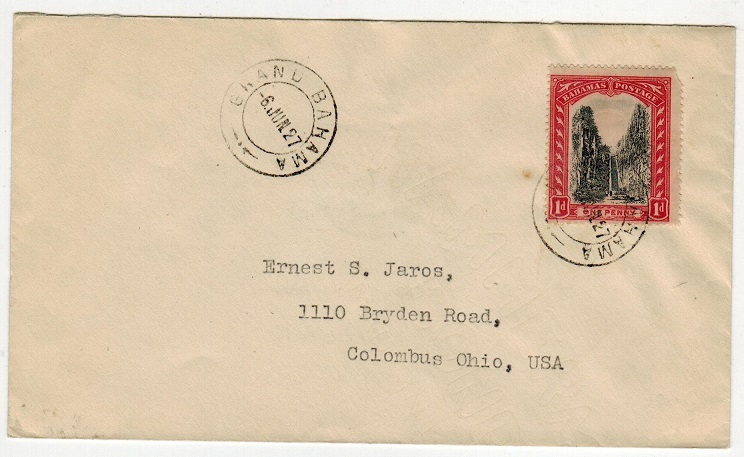 1902 2d red on cream registered postal stationery envelope (size H2) in unused condition. Slight fault under flap from adherence but a difficult size. H&G 2b. 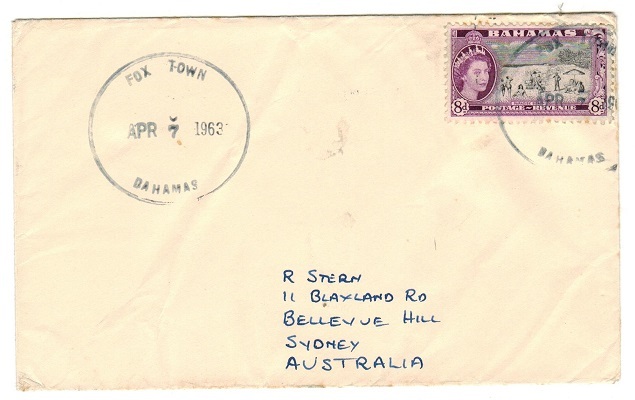 BAHAMAS - 1963 8d rate cover to Australia used at FOX TOWN. 1963 (APR.7.) cover addressed to Australia (light surface bend) bearing 'QEII' 8d tied by large FOX TOWN 'trd' cancel. 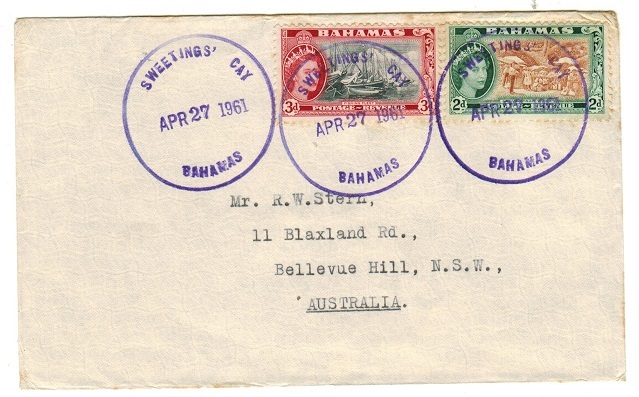 BAHAMAS - 1961 5d rate cover to Australia used at SWEETINGS CAY. 1961 (APR.27.) 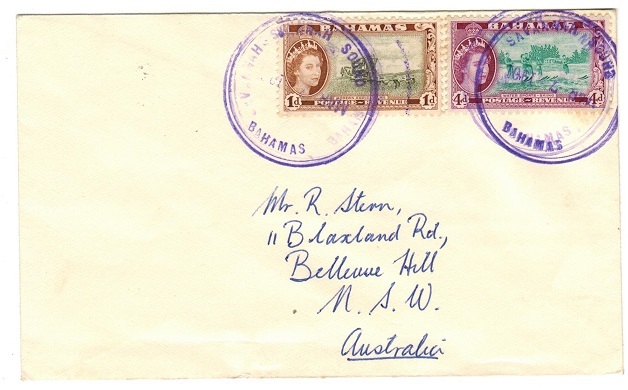 cover addressed to Australia bearing 'QEII' 2d and 3d adhesives tied by large SWEETINGS CAY 'trd' cancel in violet. 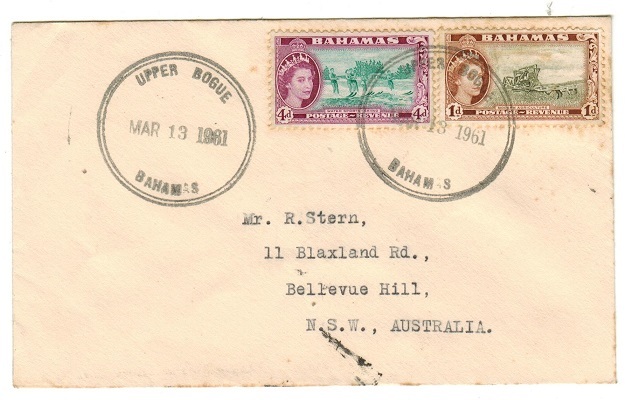 BAHAMAS - 1961 5d rate cover to Australia used at UPPER BOGUE. 1961 (MAR.13.) cover addressed to Australia bearing 'QEII' 1d and 4d adhesives tied by black UPPER BOGUE 'trd' cancel. 1963 (APR.7.) cover addressed to Australia bearing 'QEII' 8d tied by large FOX TOWN 'trd' cancel. BAHAMAS - 1947 'Victory' pair on local cover used at DEVILS POINT. 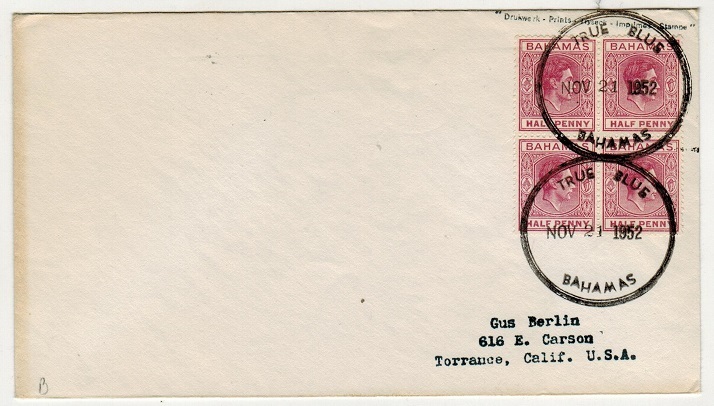 1947 (APR.4) locally addressed cover bearing the 1946 Victory pair cancelled by individual blotchy 'DEVILS POINT TRD's with additional strike at right. Scarce. BAHAMAS - 1947 'Victory' pair used on local cover at SANDY POINT. 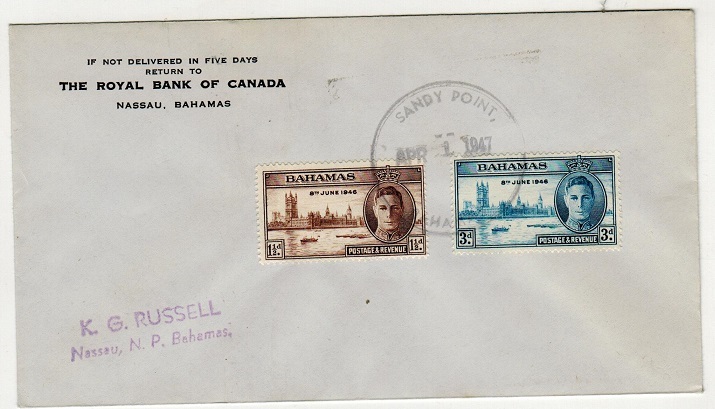 1947 (APR.1) cover addressed locally & bearing 'Victory' pair tied by SANDY POINT/BAHAMAS TRD cancel. Proud type D1. Scarce. 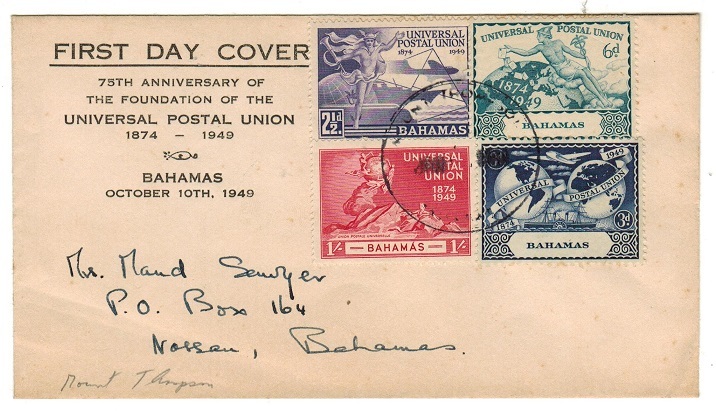 BAHAMAS - 1949 'UPU' first day cover used locally at MOUNT THOMPSON. 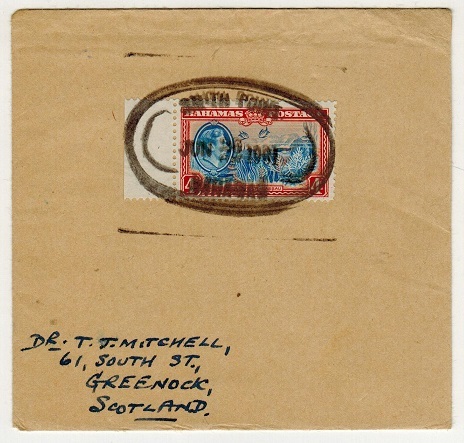 1949 pre-printed first day cover for the foundation of the UPU addressed locally and bearing the UPU set of four (SG 196-99) tied by a light strike of the scarce MOUNT THOMPSON TRD cancel. Proud type D1. BAHAMAS - 195(2) 6d rate cover to USA used at MAN OF WAR CAY. 1952 (circa) to USA bearing 2d green strip of three (SG 152c) tied by large violet MAN OF WAR/BAHAMAS temporary rubber h/s dated AUG.12.195 (last digit missing). Light central bend not affecting stamps or cancel. Proud type D7. 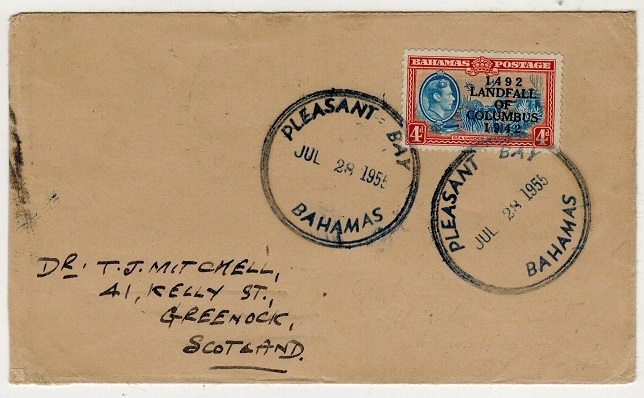 BAHAMAS - 1951 2 1/2d rate cover to UK used at FAIRFIELD. 1951 (AUG.25) cover to UK bearing 2 1/2d (SG 153a) cancelled by FAIRFIELD/BAHAMAS temporary date stamp in violet. Proud type D1. BAHAMAS - 1952 2d rate cover to USA used at TRUE BLUE. 1952 (NO.21) cover to USA bearing 1/2d block of four (SG 149c) tied by black TRUE BLUE/BAHAMAS cancel. Proud type D1. BAHAMAS - 1953 2d rate cover to USA used at LOVELY BAY. 1953 (APR.1) cover to USA bearing 'KGVI' 1/2d & 1 1/2d adhesives (SG 149d+151) cancelled by large LOVELY BAY/BAHAMAS temporary rubber date stamp in red. Being under paid marked in manuscript 'T/30' with NEW YORK/DUE 10 CENTS' Proud type D1. BAHAMAS - 1953 1 1/2d rate local cover used at BARRATERRE. 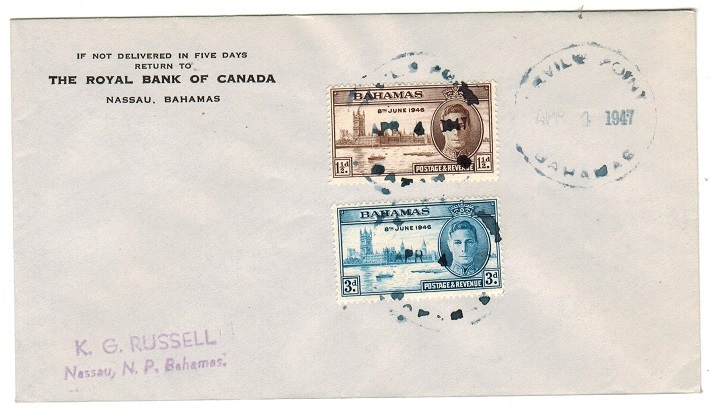 1953 (MAR.13) cover addressed locally bearing 'KGVI' 1 1/2d adhesive (small puncture) cancelled by the large d/r BARRATERRE/BAHAMAS TRD type cancel in blue. (Proud type D1). NASSAU arrival b/s. BAHAMAS - 1955 4d rate cover to UK used at PLEASANT BAY. 1955 (JUL.28) cover to UK bearing 'KGVI' 4d adhesive (SG 168) tied by PLEASANT BAY/BAHAMAS 'TRD'. Proud type D1. BAHAMAS - 1961 4d rate cover to UK used at SMITH POINT. 1961 (JUN.22) cover to UK bearing 'KGVI' 4d (SG 158) tied by black oval SMITH POINT/BAHAMAS 'TRD' . Proud type D1. Limited use. BAHAMAS - 1947 1 1/2d rate cover to USA used at GOVERNORS HARBOUR. 1947 (FEB.12.) cover addressed to USA bearing 1 1/2d brown 'Victory' adhesive tied by GOVERNORS HARBOUR/BAHAMAS cds. A scarce genuine use of this victory stamp. 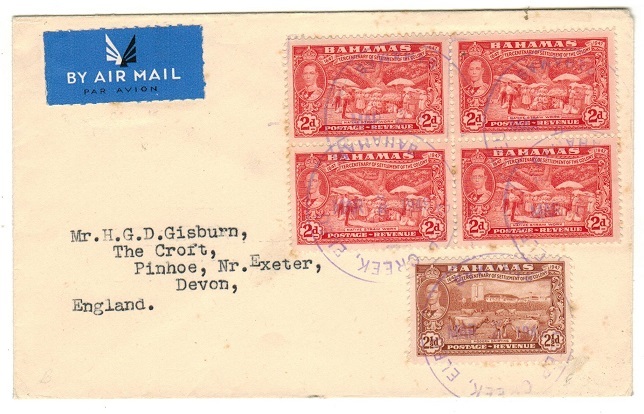 BAHAMAS - 1939 'M.S.Gripholm' maritime cover to USA cancelled by SHIP MAIL NASSAU strike. 1939 (FE.3) cover to USA bearing US 3c tied by scarce SHIP MAIL NASSAU straight line barred cds with fine blue M/S GRIPOHOLM maritime h/s. 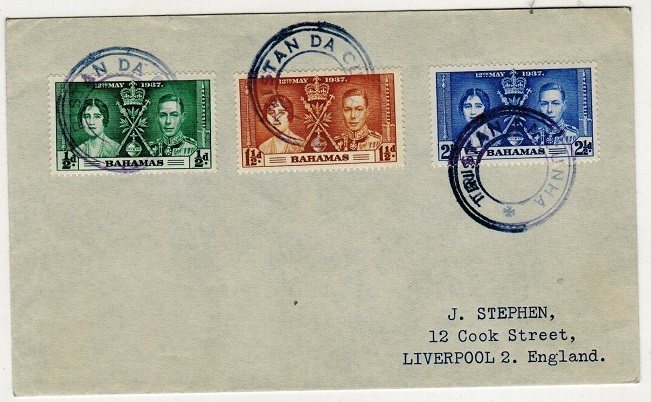 BAHAMAS - 1937 'Coronation' series on cover to UK used at TRISTAN DA CUNHA. 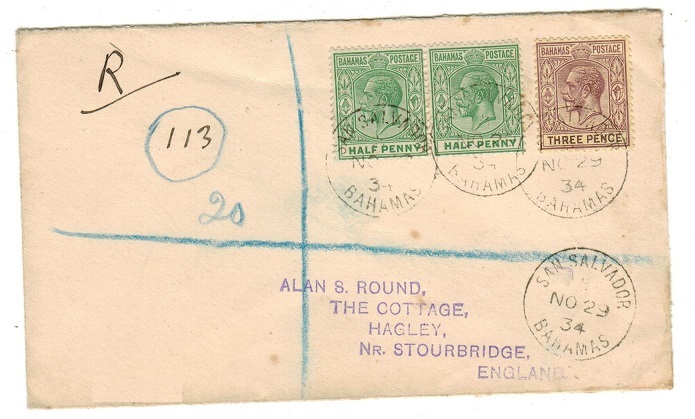 1937 Coronation trio (SG 146-148) tied to cover to UK by individual TRISTAN DA CUNHA h/s's in blue. (SG C9/type VII). 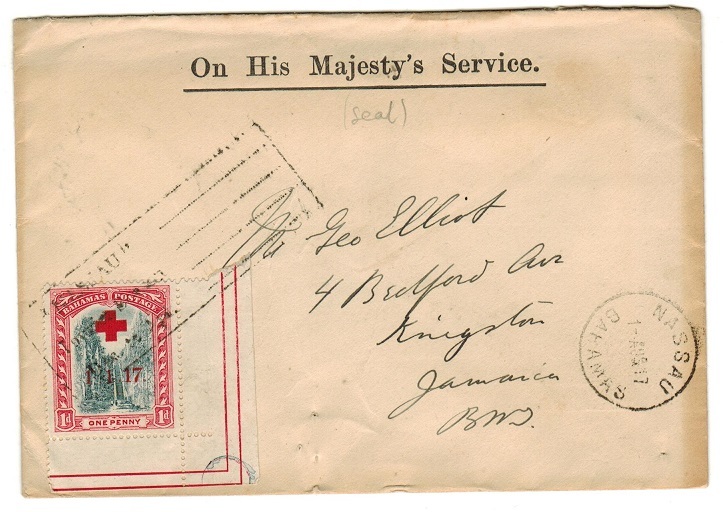 BAHAMAS - 1937 mixed franking 'Knights Of Malta' paquebot cover to Malta. 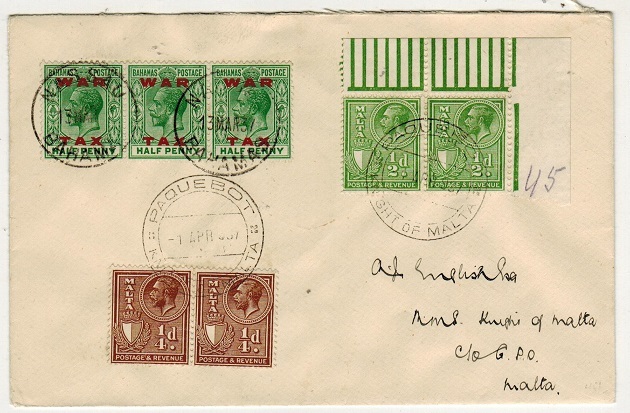 1937 (MAR.13) cover to Malta bearing 1/2d 'War Tax' strip of three (SG 102) tied by NASSAU/ BAHAMAS cds's with Maltese 1/4d & 1/2d adhesive pairs added on route & tied by d/r PAQUEBOT /KNIGHTS OF MALTA cds's dated 1.APR.1937. VALLETTA/MALTA arrival b/s dated MR.31.37. 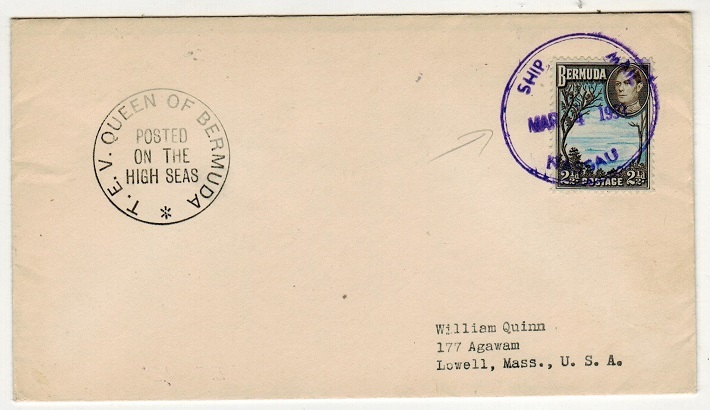 BAHAMAS - 1953 'T.E.V.QUEEN OF BERMUDA' maritime cover to USA. 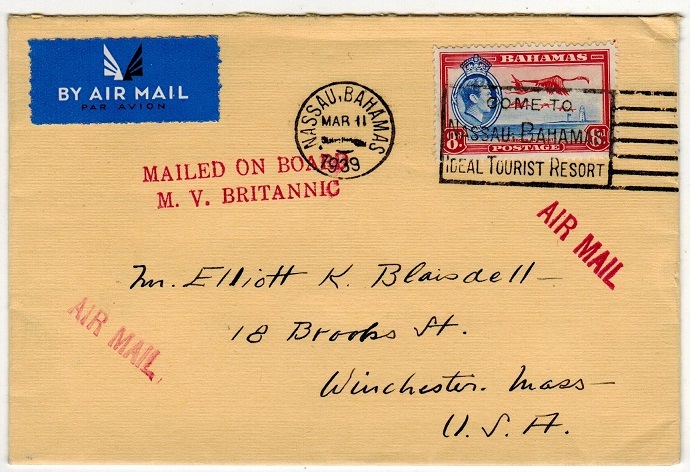 1953 (Mr.4) cover to USA bearing BERMUDA 2 1/2d (SG 113a) tied by violet d/r SHIP MAIL/ NASSAU cds with T.E.V.QUEEN OF BERMUDA maritime cachet at left. BAHAMAS - 1947 3d rate cover to USA used at PALMETTO POINT. 1947 (AUG.26) cover addressed to USA bearing 3d Victory (SG 177) tied PALMETTO POINT/ BAHAMAS. BAHAMAS - 1947 1/2d rate local cover used at PALMETTO POINT. 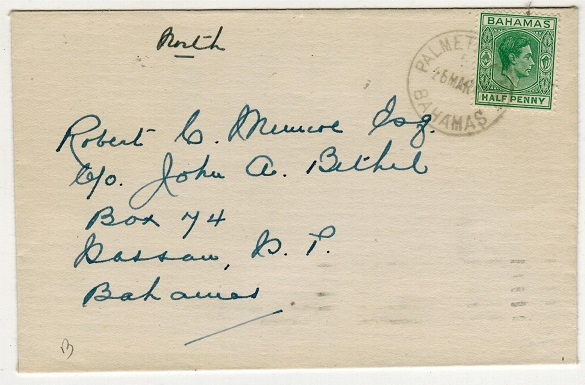 1947 (MAR.26) cover addressed locally bearing 1/2d green (SG 149) tied by PALMETTO POINT/BAHAMAS cds. 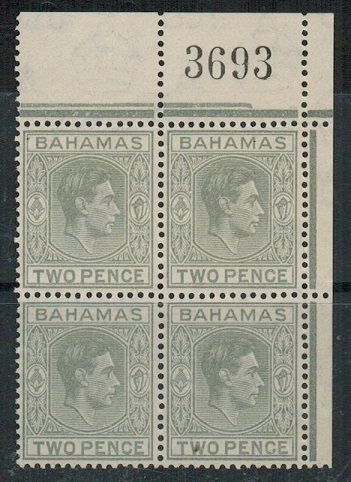 BAHAMAS - 1938 (circa) 75sk black and green ATLANTIS label in a IMPERFORATE BLOCK OF 4. 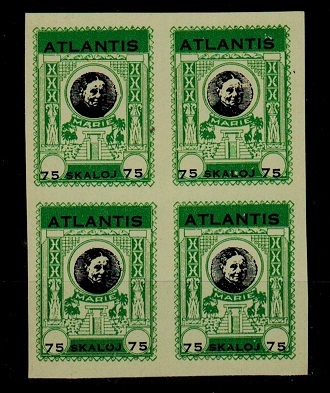 1938 (circa) 75 Skaloj black and green ATLANTIS adhesive in a fine IMPERFORATE block of four on gummed paper. These 'cinderella' stamps often found used in conjuction with Bahamas covers around this period. Some information accompanies. BAHAMAS - 1950 'S/S EUROPA' maritime cover to USA with Jamaican 3d adhesive used at NASSAU. 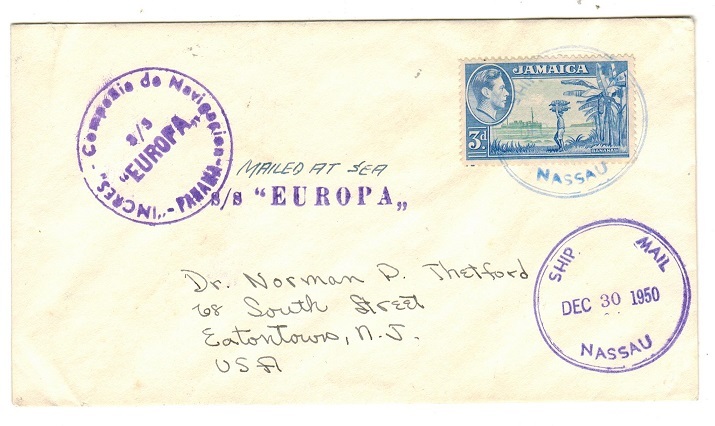 1950 (DEC.30) cover to USA bearing Jamaican 3d adhesive tied by d/r SHIP MAIL NASSAU h/s in 'blue' with additional strike below but applied in 'violet'. Struck at left by violet S/S EUROPA marking & circular INCRES COMPOLIE NAVIGATION/PANAMA maritime cachet. 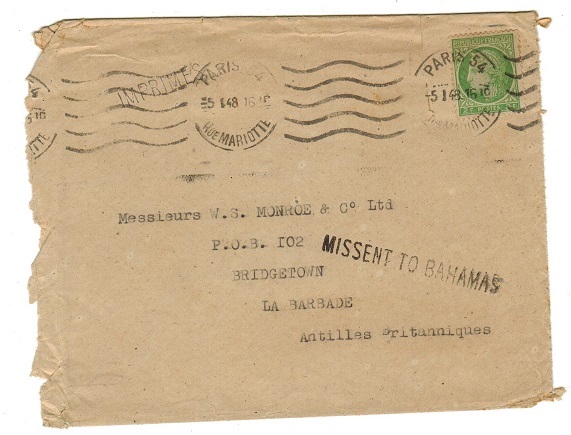 BAHAMAS - 1940 cto'd 'S/S MUNARGO/STEAMSHIP SERVICE' unaddressed cover. 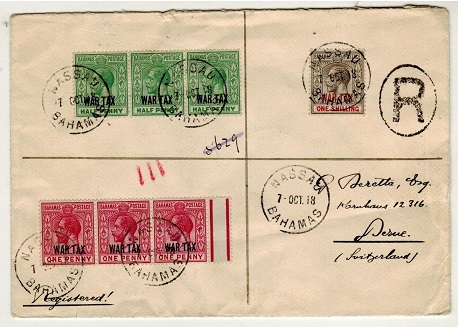 1940 (DE.11) unaddressed cover bearing the 1937 Coronation trio (SG 146-8) tied by NASSAU/ BAHAMAS cds with fine MUNARGO LINE COMPANY/S/S MUNARGO/STEAMSHIP SERVICE maritime h/s at left dated DE.13.40. 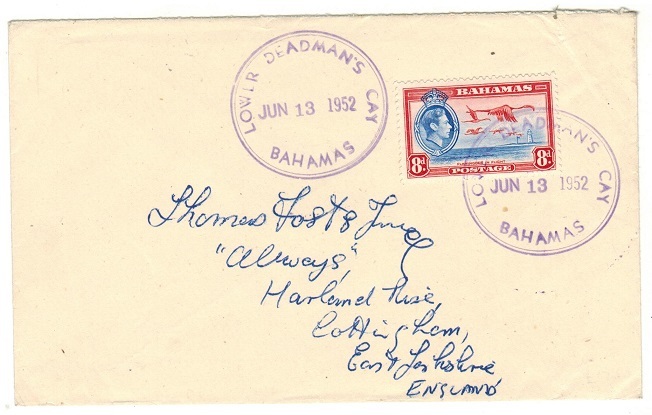 BAHAMAS - 1937 'C.N.S.LADY SOMERS' maritime cover to USA. 1937 cover addressed to USA bearing Bahamas 2 1/2d 'Coronation' adhesive cancelled by manuscript cross with JAMAICA PAQUEBOT cds applied and black C.N.S.LADY SOMERS/POSTED ON THE HIGH SEAS/PURSERS OFFICE cachet at lower left. 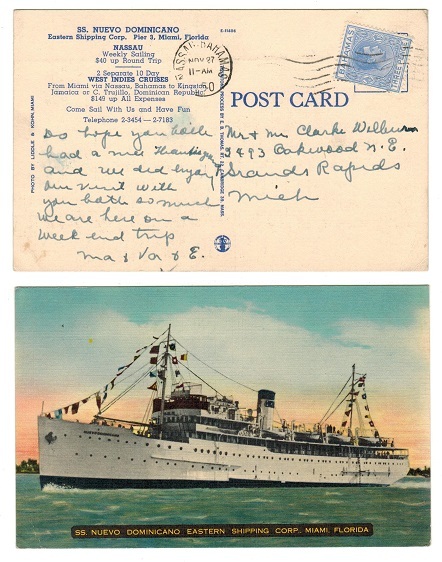 BAHAMAS - 1939 'S/S STUYVESANT' maritime postcard use to USA. 1939 (FEB.23.) 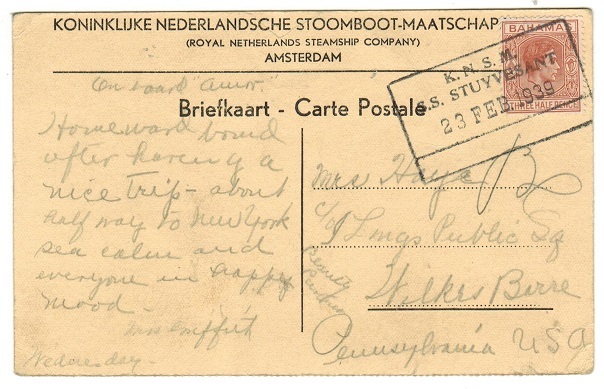 'Koninklijke Nederlandsche Stoomboot-Maatschap' pre-printed postcard addressed to USA bearing 1 1/2d adhesive tied by boxed K.N.S.M./SS. STUYVESANT maritime handstamp. BAHAMAS - 1938 cover to UK used at LOVELY BAY. 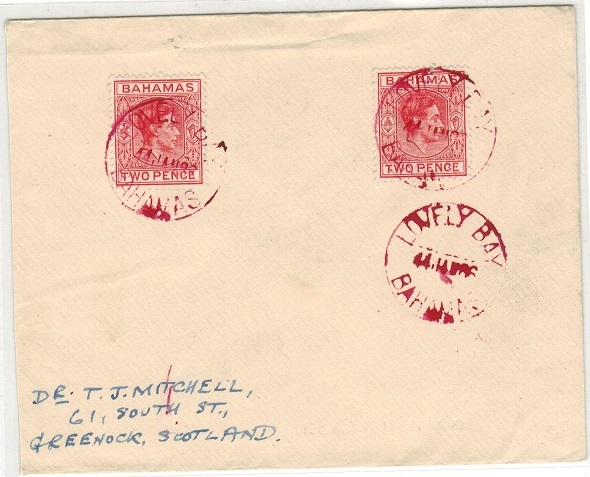 1938 (JAN.4) 'Mitchell' cover to UK bearing 2d (x2) each tied by LOVELY BAY/BAHAMAS cds struck in 'red' ink. BAHAMAS - 1918 5d 'Special Delivery' U/M block of four with RIFLE MAN variety. SG S3. 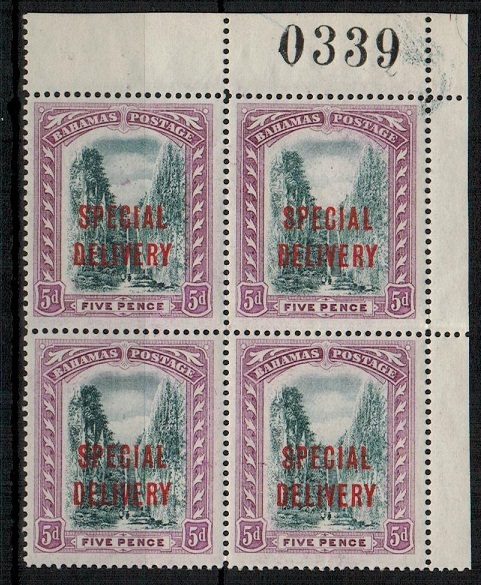 1918 5d black and mauve 'Special Delivery' adhesive in a fine sheet numbered unmounted mint corner block of four showing the HALF TREE TRUNK/RIFLE MAN variety on Row 1/12. SG S3. BAHAMAS - 1941 2d scarlet on local cover. 1941 (SEP.23.) 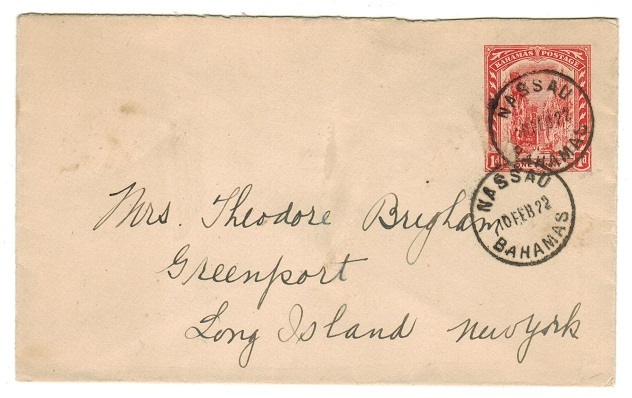 local cover bearing the 2d scarlet (SG 152b) tied by NASSAU cds. 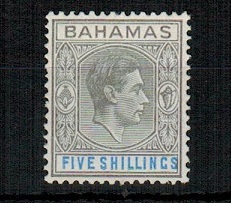 BAHAMAS - 1941 1d grey on local FDC. 1941 (SEP.17.) local cover bearing 1d olive grey adhesive (SG 150a) cancelled on its first day of issue by NASSAU cds. 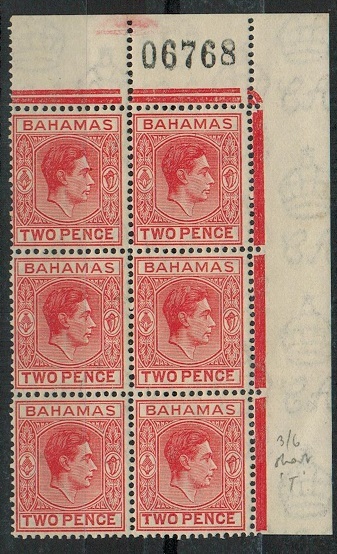 BAHAMAS - 1941 2d scarlet mint block of six showing SHORT T variety. SG 152bb. 1941 2d scarlet (lightly overall toned) in a mint top corner marginal block of six with sheet number in margin and showing the SHORT T variety on Row 3/6. Cat £140+. SG 152bb. BAHAMAS - 1938 (circa) 5sk and 10sk ATLANTIS adhesives IMPERFORATE. 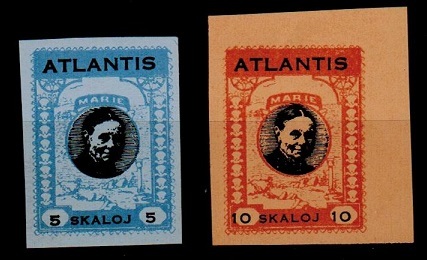 1938 (circa) 5 Skaloj black on blue and 10 skaloj black on orange ATLANTIS adhesives each in IMPERFORATE examples. These 'cinderella' stamps often found used in conjuction with Bahamas covers around this period. 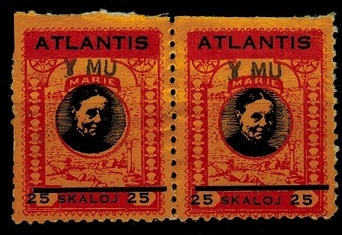 BAHAMAS - 1938 (circa) 25sk ATLANTIS adhesive pair overprinted 'Y MU'. 1938 (circa) 25 SKALOJ ATLANTIS adhesive perforated pair each handstamped 'Y MU' in green. These 'cinderella' stamps often found used in conjuction with Bahamas covers around this period. 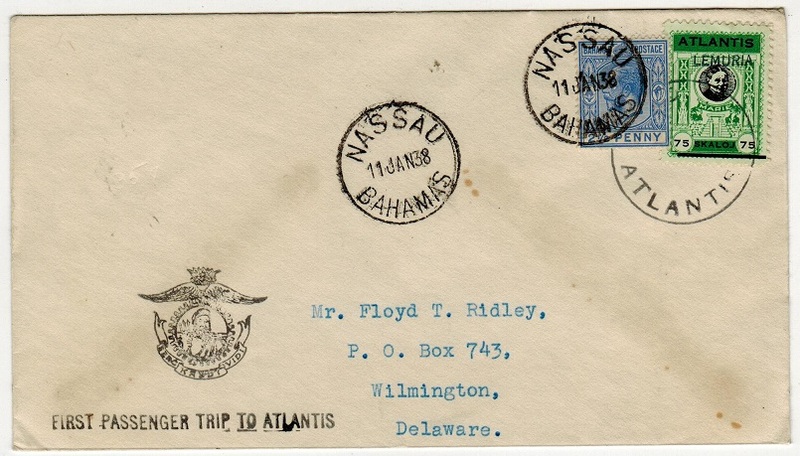 BAHAMAS - 1929 first flight cover to USA by FAM 7. 1929 (JA.2) Pre-printed FAM 7-First flight/Nassau-Miami cover bearing 2 1/2d (SG119) tied NASSAU with red two lined BY FIRST AIR MAIL/TO MIAMI FLA h/s. 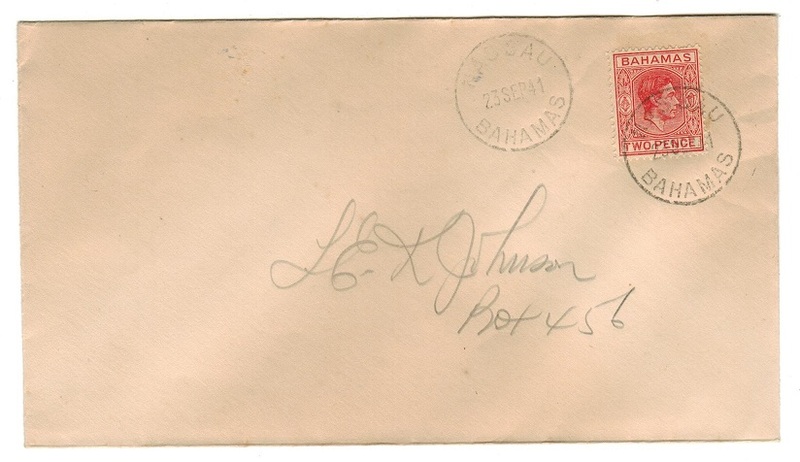 BAHAMAS - 1917 1d 'Red Cross' used on OHMS cover to Jamaica. 1917 (AUG.1) O.H.M.S. 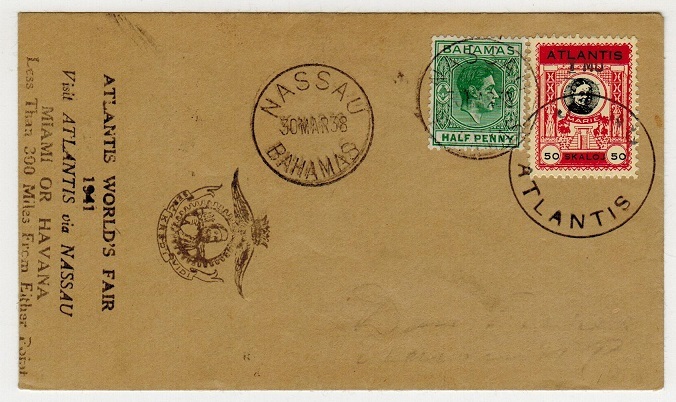 envelope (145x101mm) addressed to Jamaica bearing the 1d 'Red Cross' adhesive (SG 90) tied by NASSAU/TOURIST SEASON/DEC TO APL slogan strike (Lud HS4) with NASSAU/BAHAMAS cds at lower right. BAHAMAS - 1939 'M.V.BRITANNIC' maritime cover to USA. 1939 (MAR.11.) 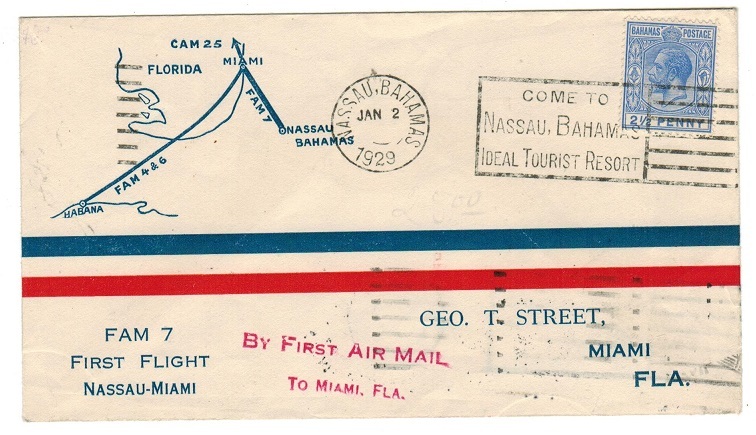 cover addressed to USA bearing 8d adhesive tied by NASSAU, BAHAMAS/ COME TO/IDEAL TOURIST RESORT slogan strike. 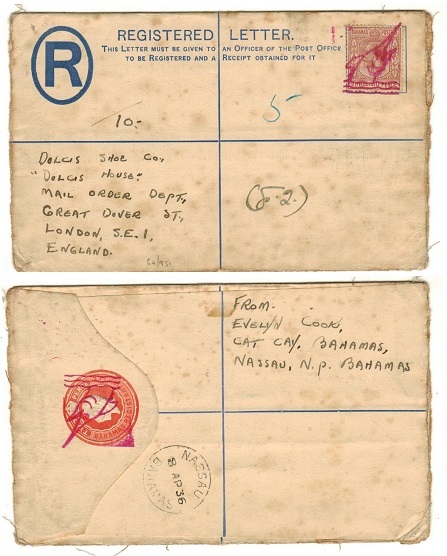 Two strikes of the AIR MAIL h/s applied in red ink and with two lined MAILED ON BOARD/M.V.BRITANNIC maritime handstamp at left. BAHAMAS - 1850 1/- rated 'missionary' outer wrapper sheet to UK. 1850 (MY.29.) outer wrapper addressed to UK rated '1/-' in manuscript and cancelled on reverse by fine BAHAMAS double arc cancel in black with 'C' code slug reversed. (Luddington type B3). BAHAMAS - 1950 3d rate postcard to USA showing 'S.S.Domincano'. 1950 (NOV.27.) use of coloured picture postcard addressed to USA depicting 'S.S.Nuevo Dominicano' of the Eastern Shipping Corp. The card is pre-printed on reverse with the Nassau sailing charges and West Indies cruise costs and bears 3d adhesive tied by NASSAU wavy line roller strike. 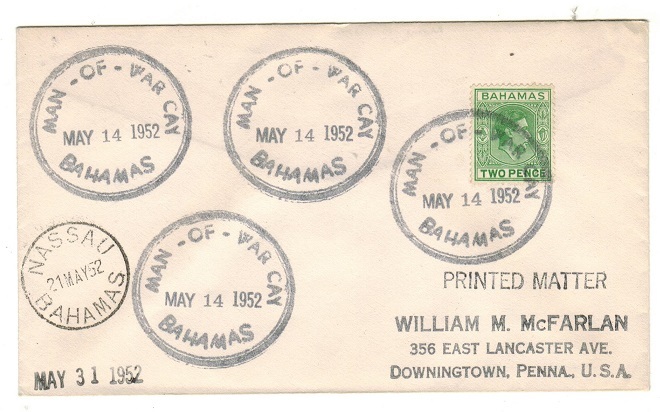 BAHAMAS - 1950 1 1/2d 'Victory' (x4) on cover to USA used at WEST END. 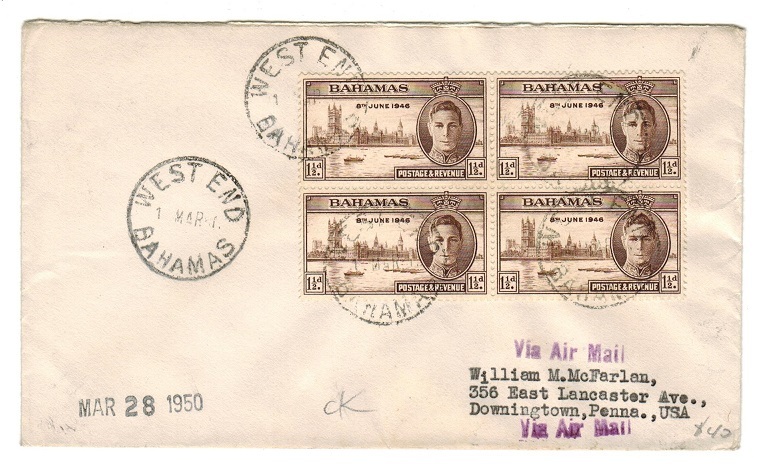 1950 (Mar.1) cover to USA bearing 1946 1 1/2d Victory block of four (SG176) tied by various WEST END/BAHAMAS cds's with violet s/l 'VIA AIR MAIL' rubber h/s. 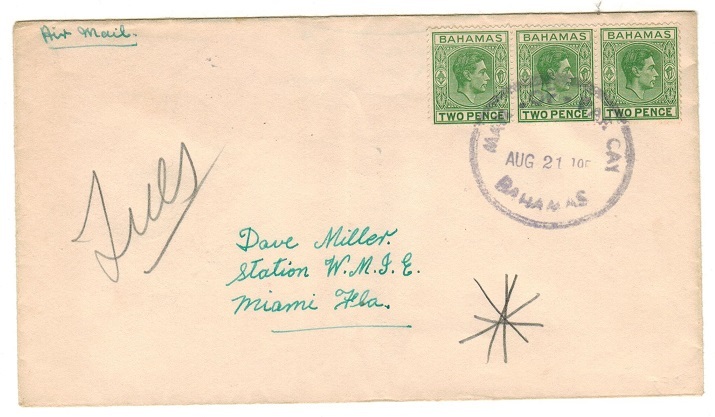 BAHAMAS - 1934 registered cover to UK used at SAN SALVADOR. 1934 (NO.29.) 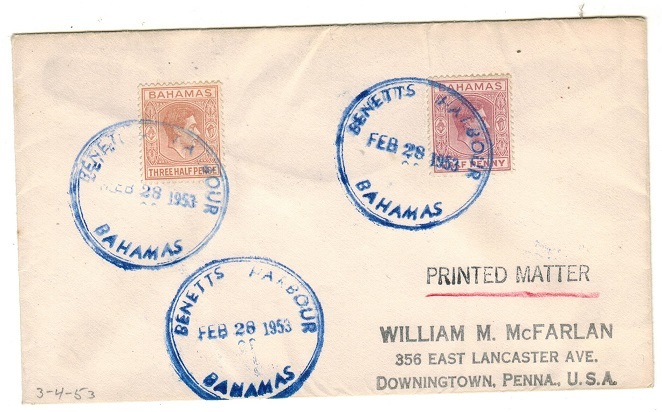 registered cover to UK (few tone spots) bearing 1/2d pair and 3d adhesives tied SAN SALVADOR/BAHAMAS. 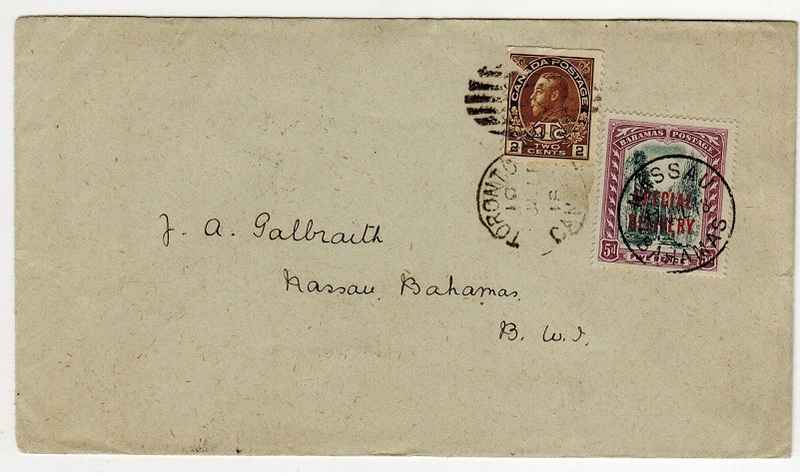 BAHAMAS - 1950 cover to UK used at ABRAHAM BAY. 1950 (circa) cover addressed to UK (few light tone spots) bearing the 2 1/2d 'Landfall' issue with 1 1/2d 'Victory' adhesive tied by ABRAHAM BAY/BAHAMAS cds's with the year slug showing a '3' inverted instead of priobably a '5'. 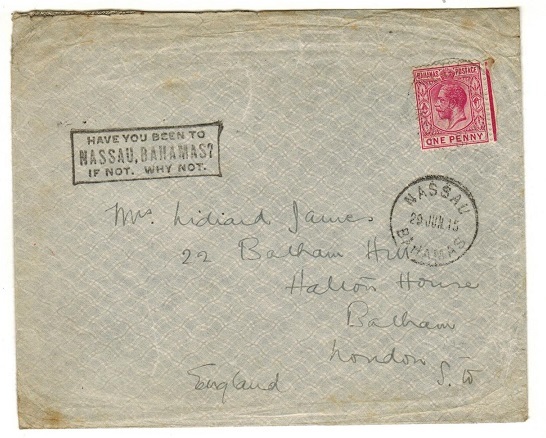 BAHAMAS - 1948 MISSENT TO BAHAMAS cover. 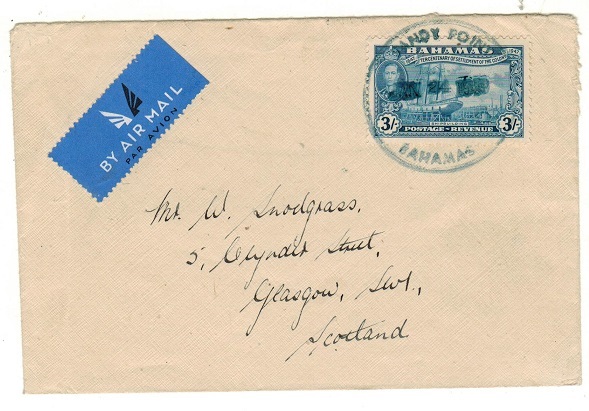 1948 cover addressed to Barbados from France (rough opening at left and edge tear at top) mis directed and with black MISSENT TO BAHAMAS instructional handstamp applied to front. BAHAMAS - 1913 1d rate local cover used at GOVERNORS HARBOUR. 1913 (APR.7.) cover addressed locally bearing GV 1d adhesive tied by light GOVERNORS HARBOUR/ BAHAMAS cds with NASSAU arrival. BAHAMAS - 1912 1d rate local cover used at THE BIGHT. 1912 (OCT.25.) 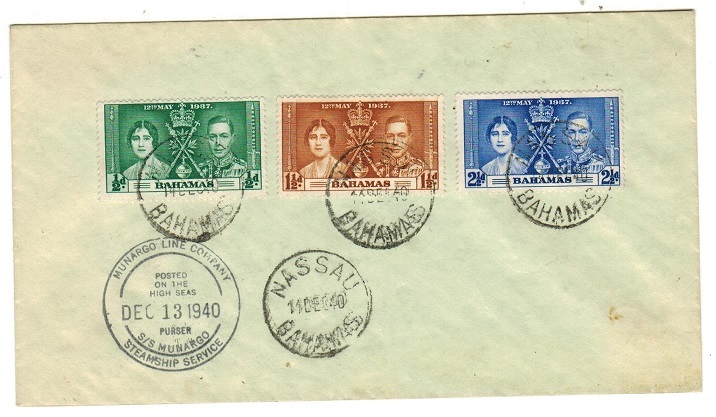 cover addressed locally bearing Edward VII 1d adhesive tied by THE BIGHT/ BAHAMAS cds with NASSAU cds at left. BAHAMAS - 1912 1d rate local cover used at HARBOUR ISLAND. 1912 (NOV.18.) 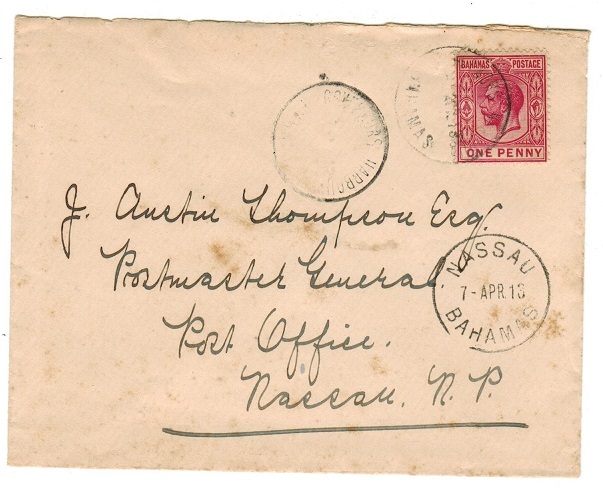 cover addressed to Nassau bearing Edward VII 1d adhesive tied by HARBOUR ISLAND/BAHAMAS cds with additional strike below and NASSAU arrival. BAHAMAS - 1901 1d PSE to USA used at NASSAU. H&G 6. 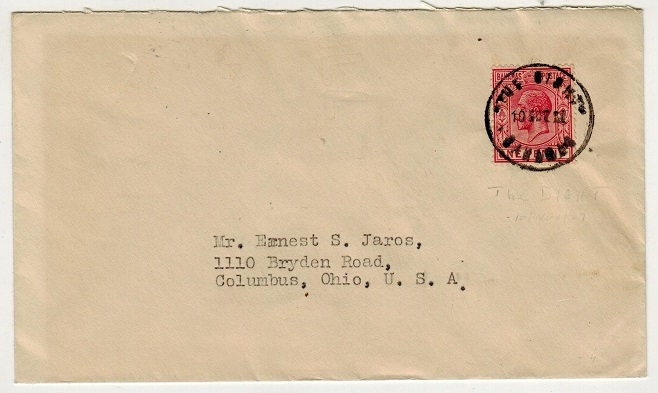 1901 1d red on thick cream postal stationery envelope addressed to USA cancelled by NASSAU/ BAHAMAS cds dated 10.FEB.22. H&G 6. BAHAMAS - 1918 inward combination cover with Canada 2c and 5d SPECIAL DELIVERY adhesive. 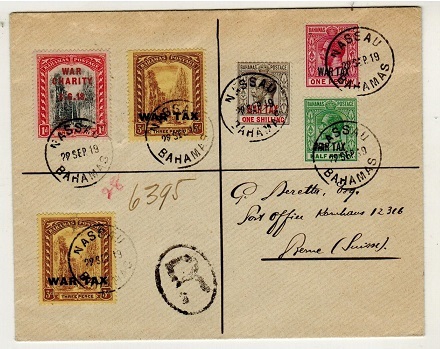 1918 (JUL.12) Inward 'Combination' cover from Canada bearing the 2c 'ITC' adhesive (SG 240) addressed to Nassau and having 5d (SG S2) SPECIAL DELIVERY stamp added & cancelled NASSAU/BAHAMAS and dated 25.JUL.18 with similar b/s. Scarce usage. BAHAMAS - 1913 1d rate cover to USA used at NASSAU. 1913 (SEP.22.) 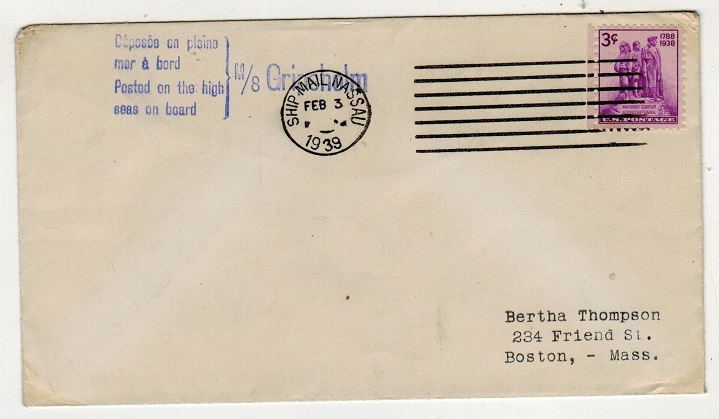 cover addressed to USA (opened on two sides) bearing 1d 'staircase' adhesive tied by NASSAU/BAHAMAS cds. 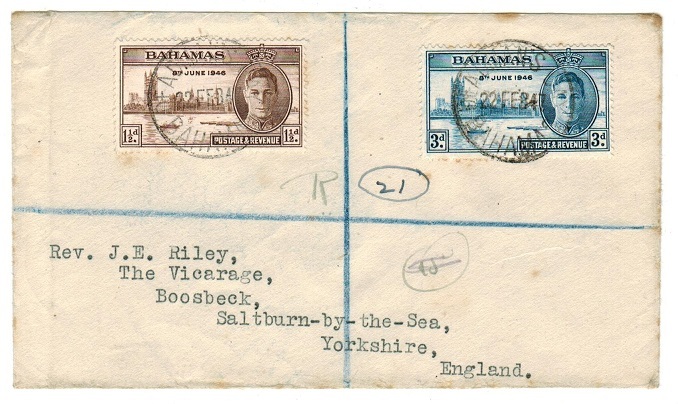 Bahamas - 1947 'Victory' pair on registered cover to UK used at DEADMANS CAY. 1947 (FEB.22) registered cover to UK bearing 'Victory' pair (SG 176-77) tied by DEADMANS CAY/BAHAMAS cds. 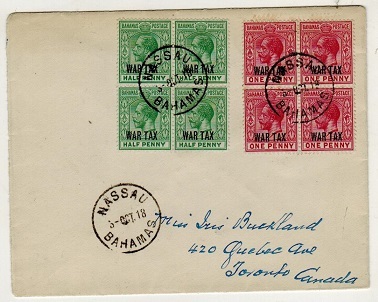 BAHAMAS - 1912 1d PSC used locally (no message) with 1/2d WAR TAX use. H&G 9. 1912 1d carmine on buff postal stationery postcard addressed to USA (no message) bearing additional 1/2d green 'War Tax' adhesive tied NASSAU/BAHAMAS dated 2.MAY.18. H&G 9. BAHAMAS - 1935 1/2d rate local cover used at GEORGETOWN. 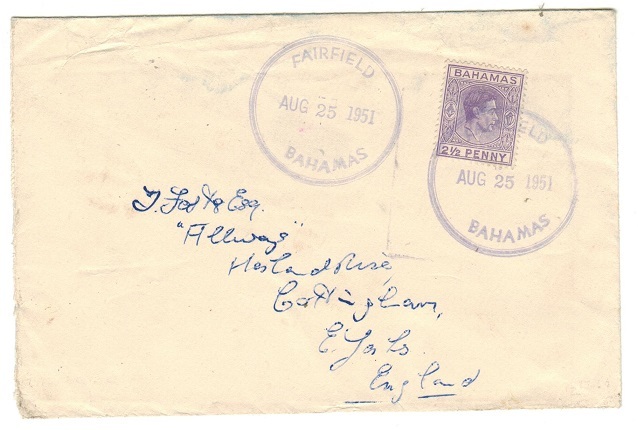 1935 (FE.29) cover addressed locally bearing 1/2d (SG 115) tied by GEORGE TOWN/ BAHAMAS cds. 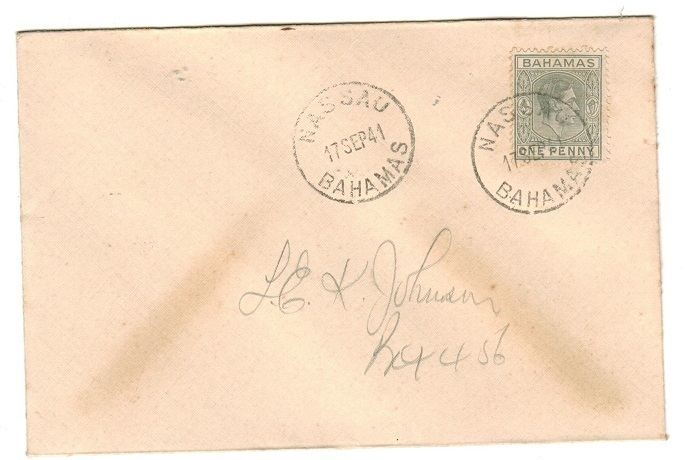 BAHAMAS - 1935 1/2d rate local cover used at HARBOUR ISLAND. 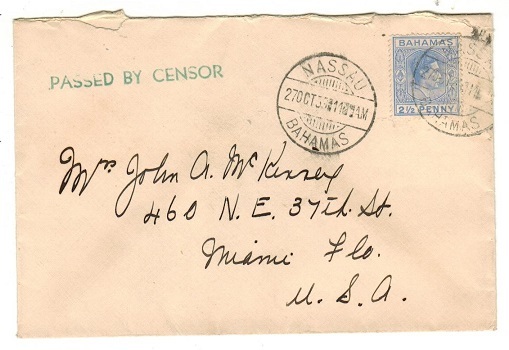 1935 (APR.8) cover addressed locally bearing 1/2d adhesive tied by very fine HARBOUR ISLAND/BAHAMAS cds. 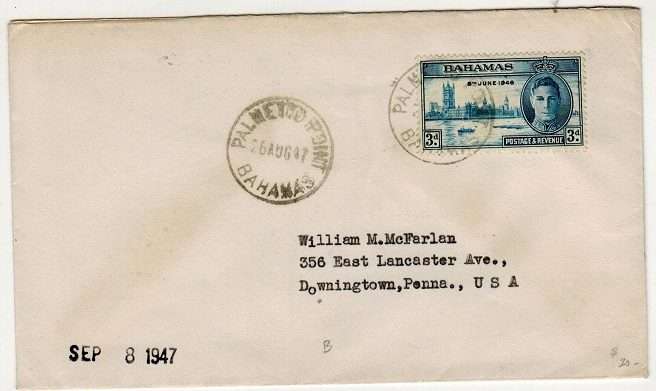 BAHAMAS - 1934 cover to USA carried by DEUTSCHE SCHIFFSPOST with NEW YORK/PAQUEBOT strike. 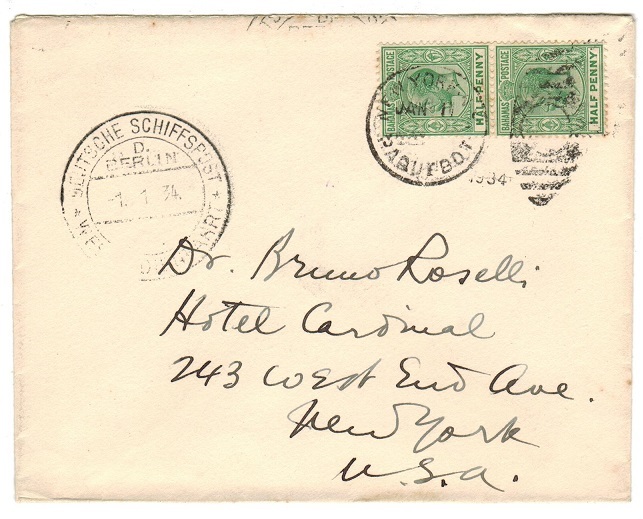 1934 (JAN.1) cover to USA bearing 1/2d pair (SG 115) tied by NEW YORK/PAQUEBOT cds with fine DEUTSCHE SCHIFFSPOST/D/BERLIN maritime h/s at left. 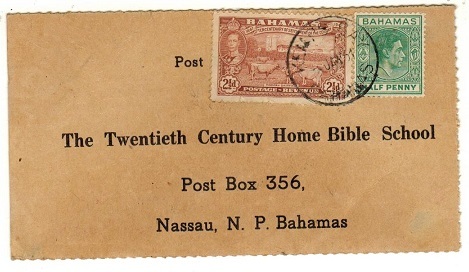 BAHAMAS - 1940 (circa) OHMS/POSTCARD in unused condition used by Nassau Post Office. 1940 (circa) black on salmon O.H.M.S./POSTCARD in unused condition pre-printed by the General Post Office at Nassau for informing collectors of current postage stamps. Unusual item.